Chances are you can still picture the facade of your childhood home. If the pipes didn’t work and the electricity kept shutting off, you probably remember that too. 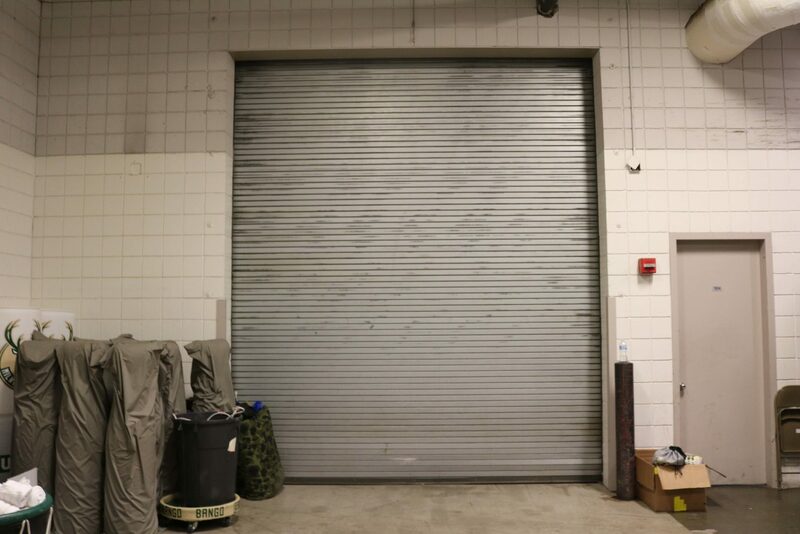 But it’s what took place between the walls—what you did, what you saw, who you spent time with, what made you laugh, what made you cry, what you cheered for—that sticks with you when the building is dust. 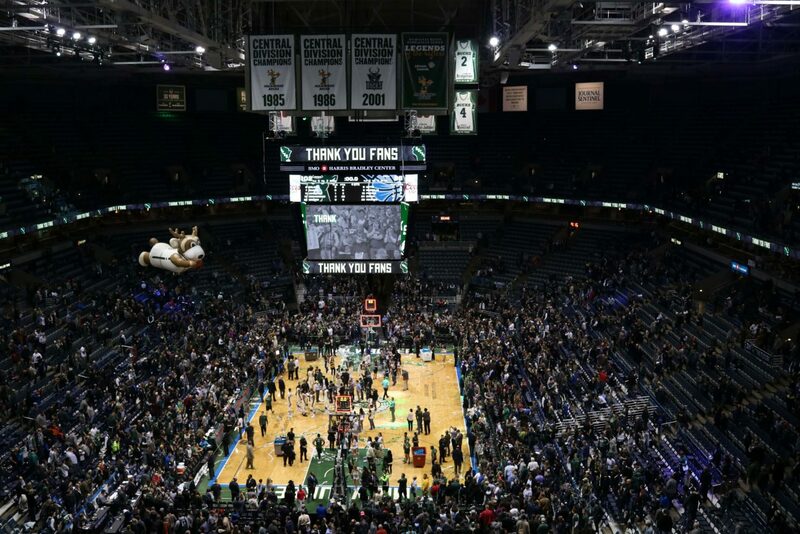 By this measure, sour feelings surrounding the BMO Harris Bradley Center are most likely due to the fact that its marquee tenant, the NBA’s Milwaukee Bucks, didn’t win all that much during the team’s three decades in the arena, especially not compared to the team’s glory years across the street at The Mecca (now the UWM Panther Arena). 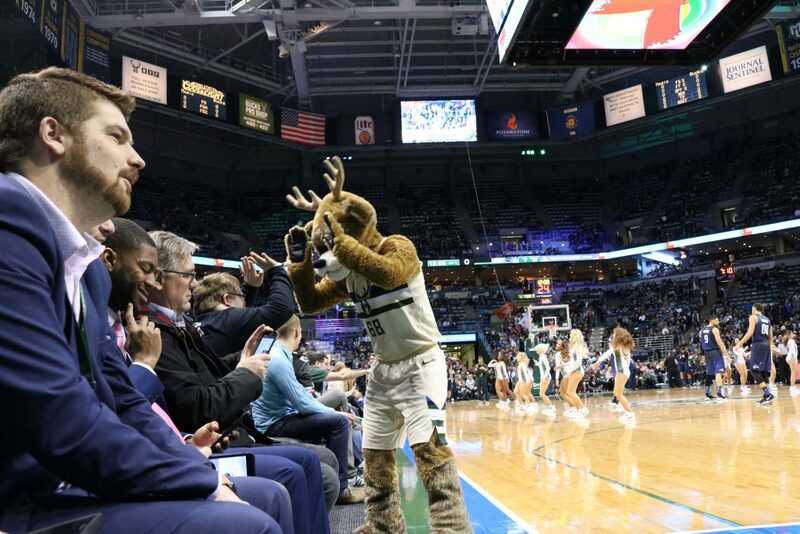 While sports played a primary role in the construction of the Bradley Center and accounted for much of its activity, there is more to its story. 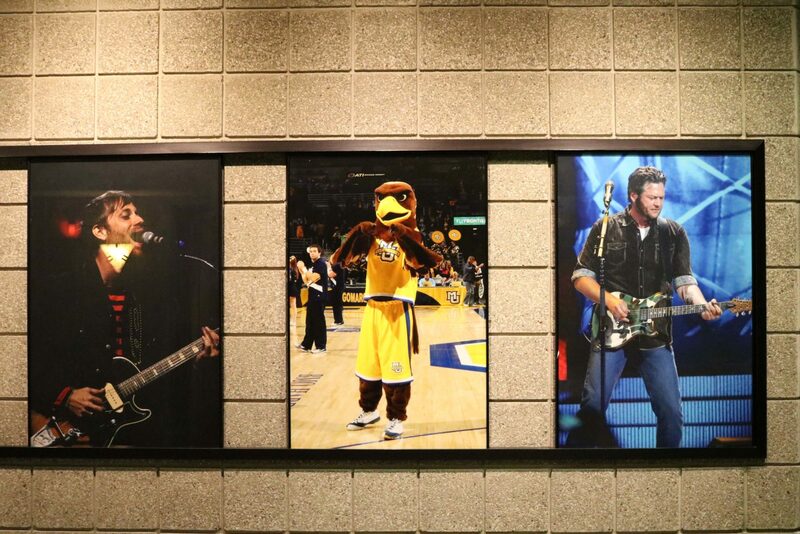 About 5,000 events took place during the Bradley Center’s 30 years in operation, including world-class concerts, family entertainment, charitable affairs, and graduation ceremonies. 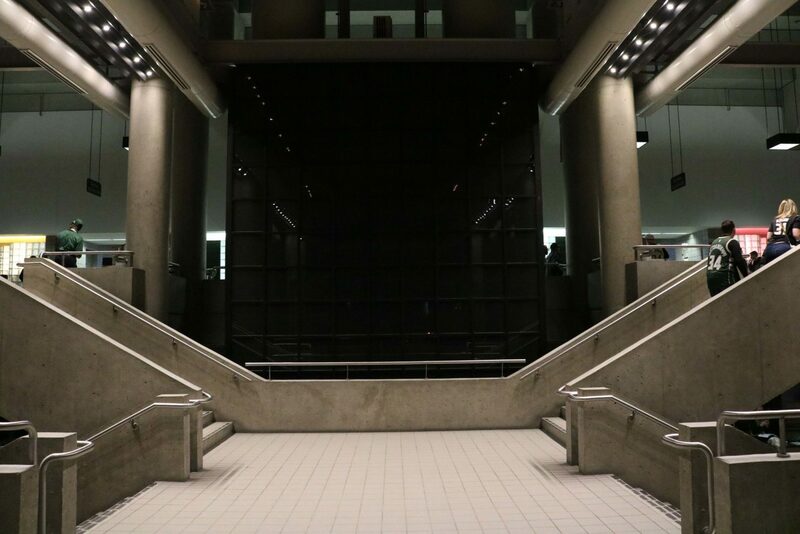 An estimated 36 million people walked through its doors, each with their own experience. 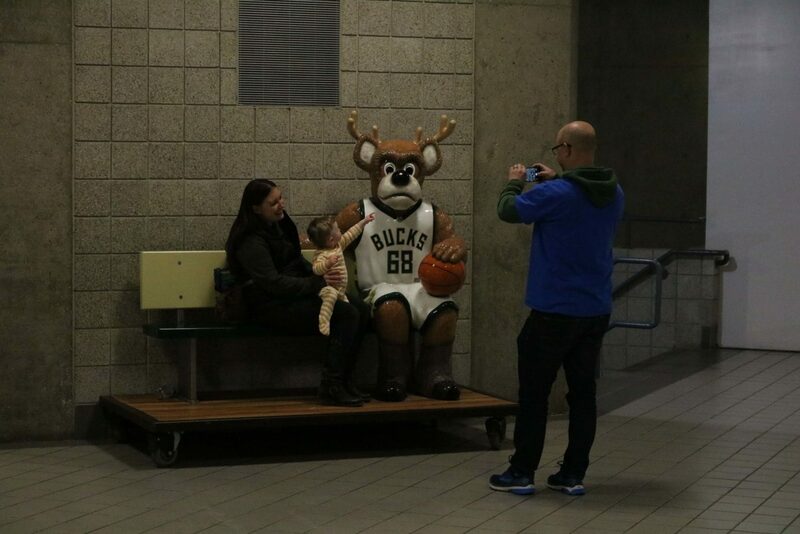 It is impossible for me to write about the Bradley Center without a certain familial affection. 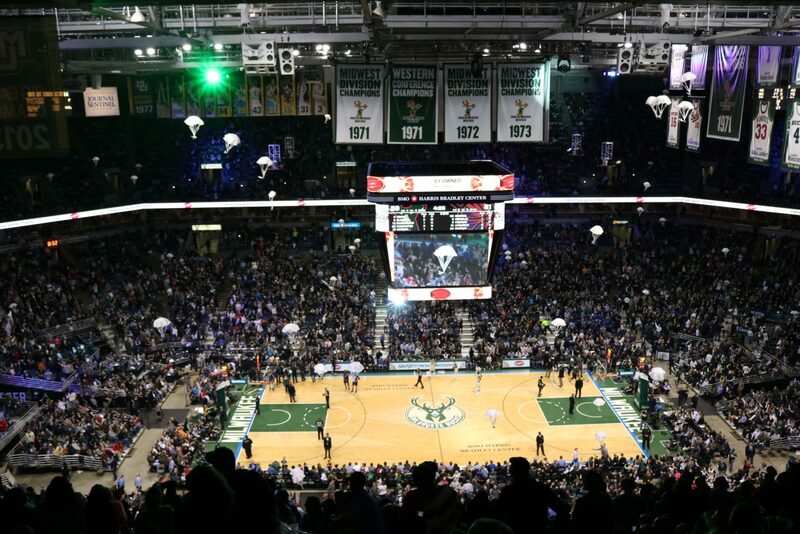 After all, plans for the arena were solidified the year I was born and over time it became like a second home. 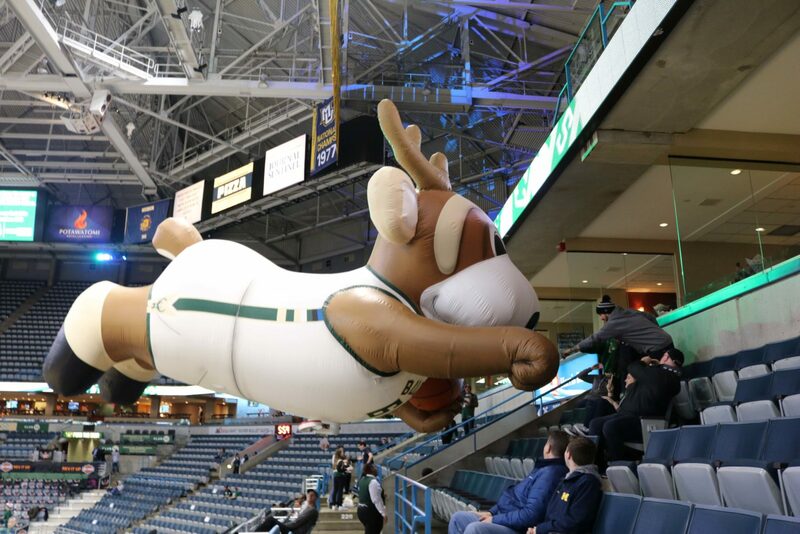 I grew up seeing over-sized, fabric versions of my favorite cartoon characters on ice and on stage at the Bradley Center. 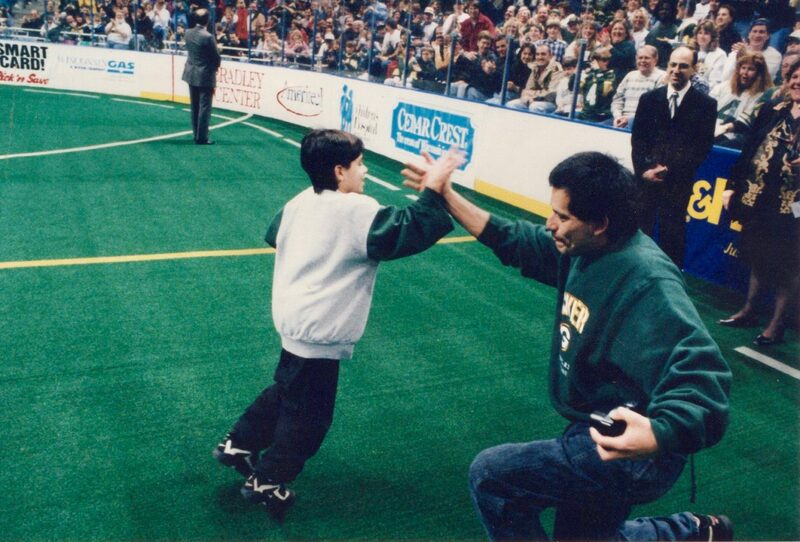 At hundreds of Bucks games I rode waves of agony and ecstasy. 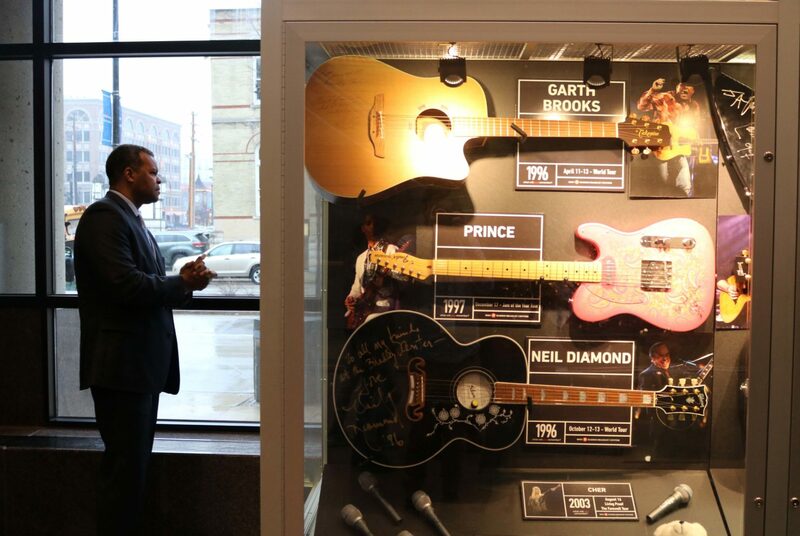 Recently, I’ve witnessed a handful of captivating concerts. 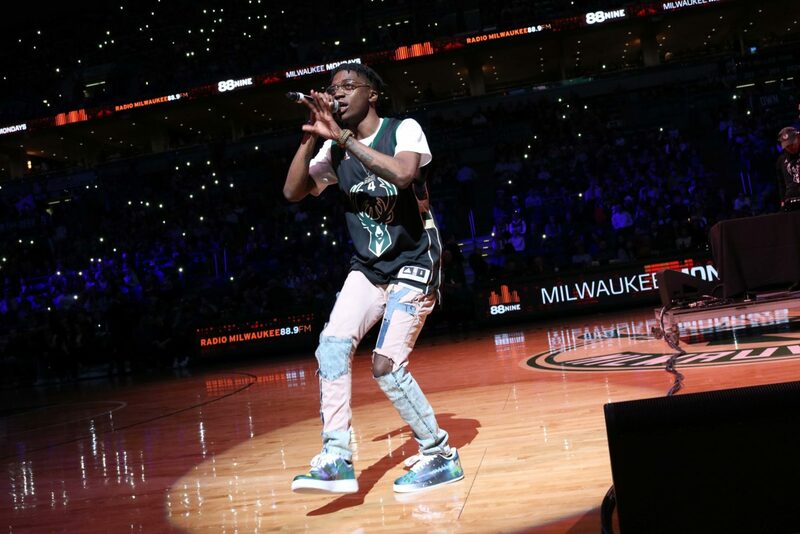 Most memorably, the Bradley Center was the scene of my craziest childhood memory—the night my kid brother brought a sold-out crowd to its feet as one of the hottest athletes on the planet “raised the roof” for him. 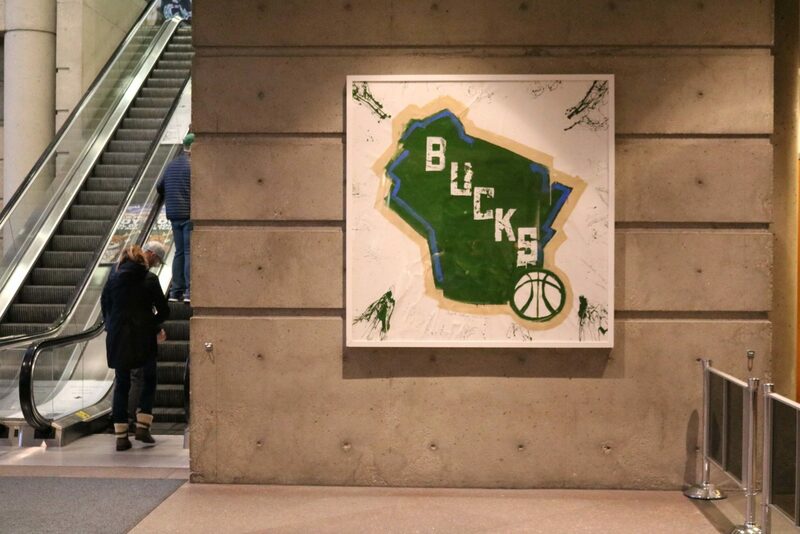 This is a requiem for the Bradley Center. 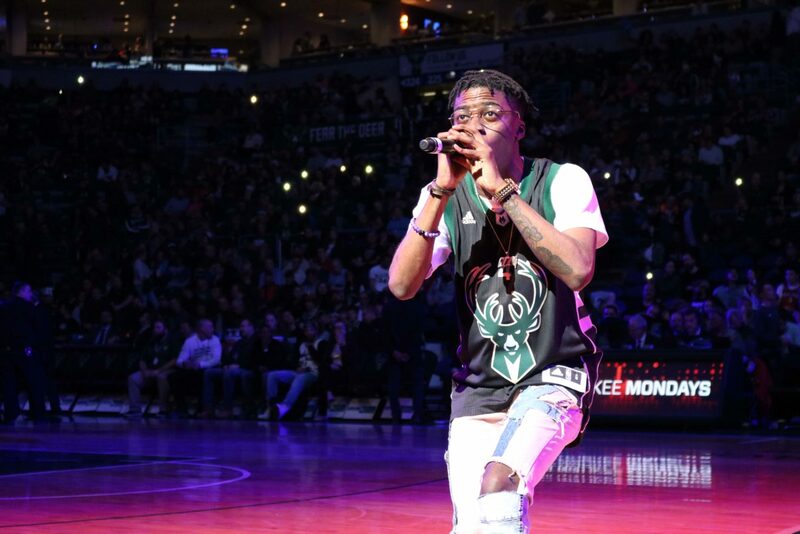 It includes interviews with Milwaukee musicians Ishmael “IshDARR” Ali, Marielle Allschwang, Tyrone “DJ Bizzon” Miller, Rhonda Begos-Zolecki, plus Bucks personnel and international basketball superstar Giannis Antetokounmpo. 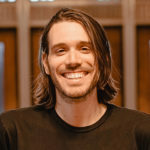 An accompanying audio file is embedded below with clips from those interviews, my retelling of my brother’s moment of glory from a 2013 Ex Fabula storytelling event and his own recollection. 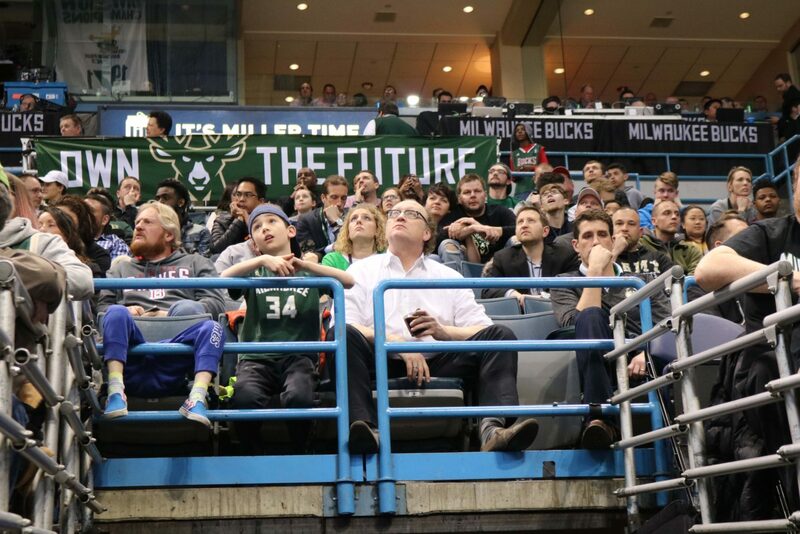 This is going to sound familiar: the head of basketball declares our team’s arena isn’t up to snuff and threatens to relocate the franchise. 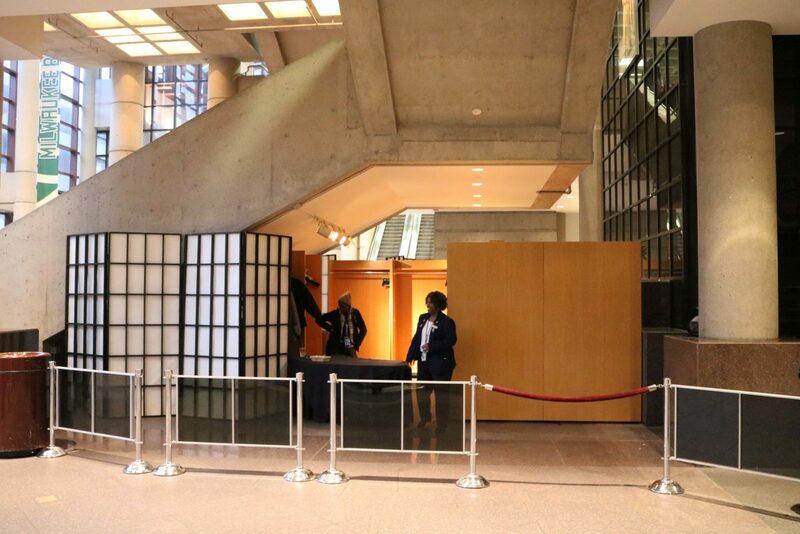 A new owner swoops in, greases wheels and a state-of-the-art building goes up next to the old one. But I’m not talking about the present day. This was the 1980s. 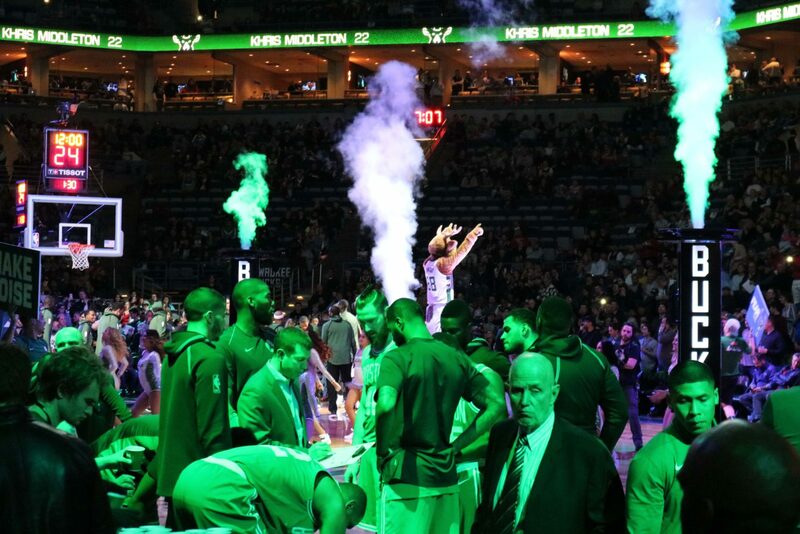 In 1985, Herb Kohl—bless his heart—bought the Bucks from Jim Fitzgerald and immediately hashed out plans for a new arena. There was talk of putting it in the Menomonee Valley next to County Stadium (where Miller Park stands today), but it ended up in downtown across from The Mecca. 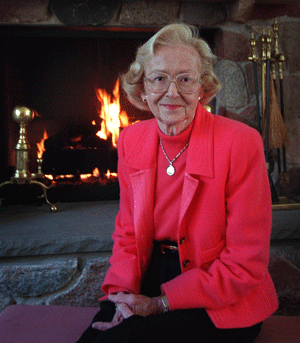 The best part was that local philanthropist Jane Bradley Pettit covered the cost. 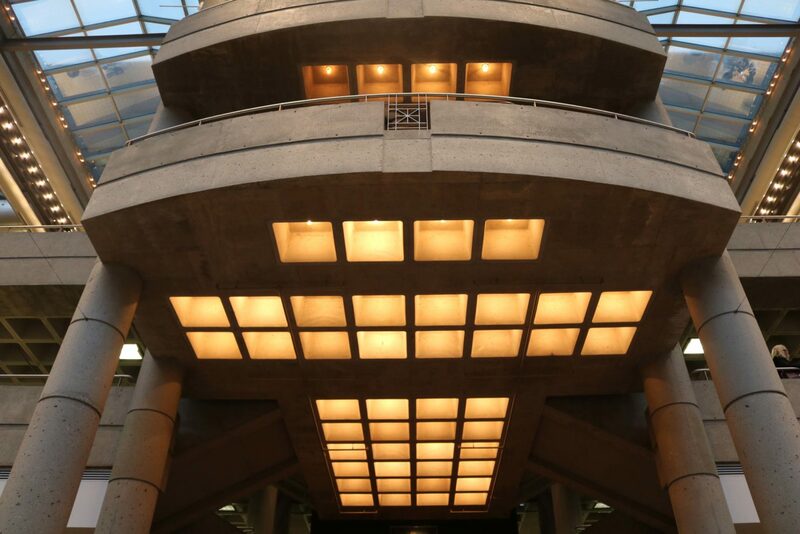 This made it the only major, public assembly facility in North America with construction underwritten by a single family. 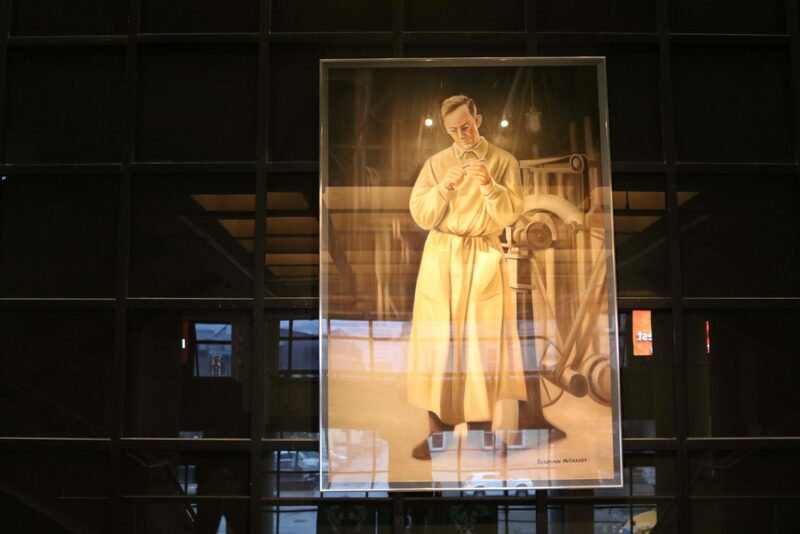 It would stand as a tribute to Petit’s father Harry Lynde Bradley, co-founder and chairman of the Allen-Bradley Company. 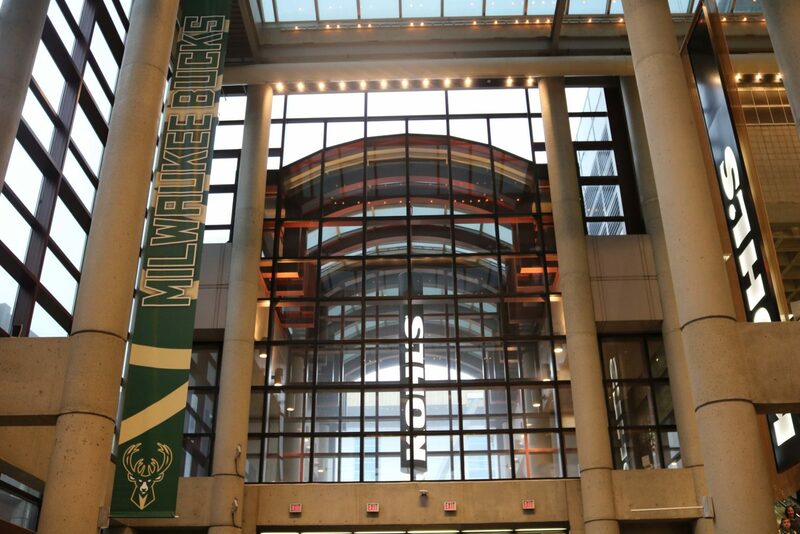 The Bradley Center is made of polished granite, rough concrete and smooth, smoked glass. 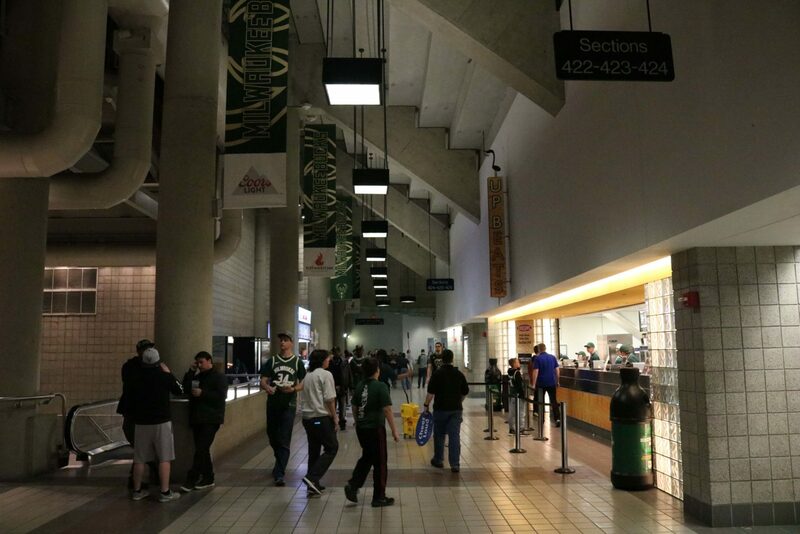 The arena is flanked by two 60-foot, glass atrium entrances. 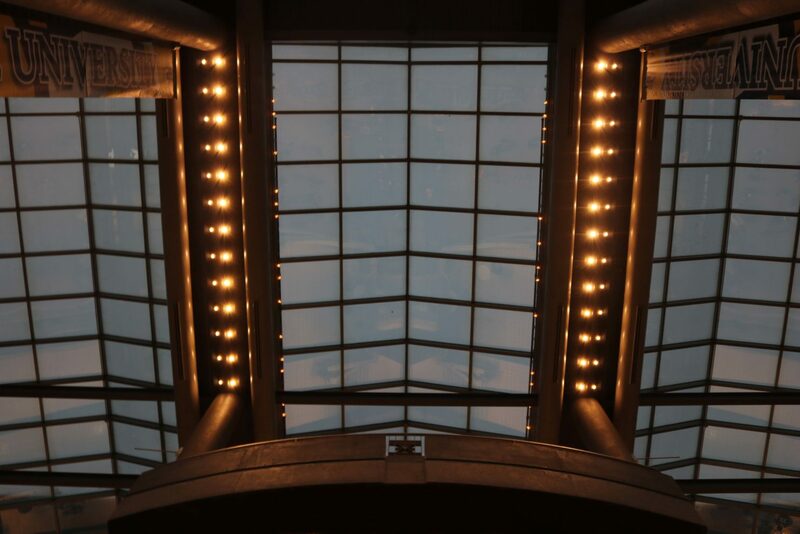 The octagon shaped black vents on the exterior are an homage to the Allen-Bradley Clock. 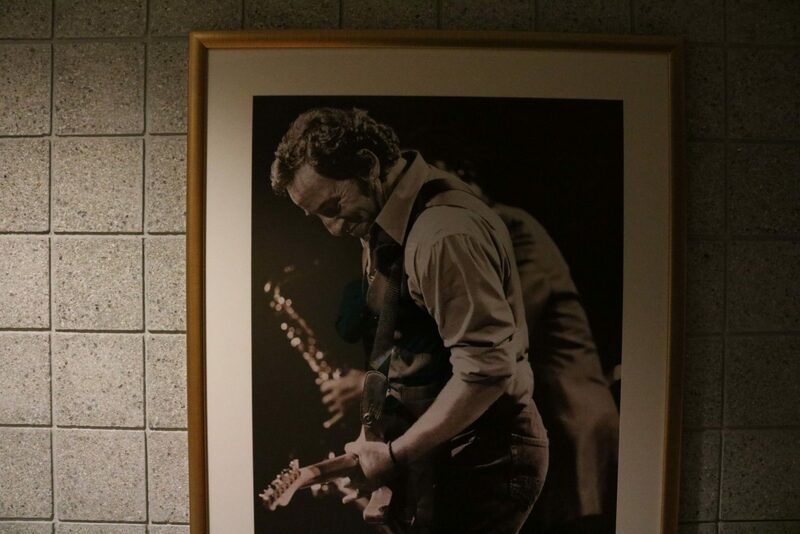 It was reported that Bruce Springsteen’s experts served as consultants on the acoustic design. 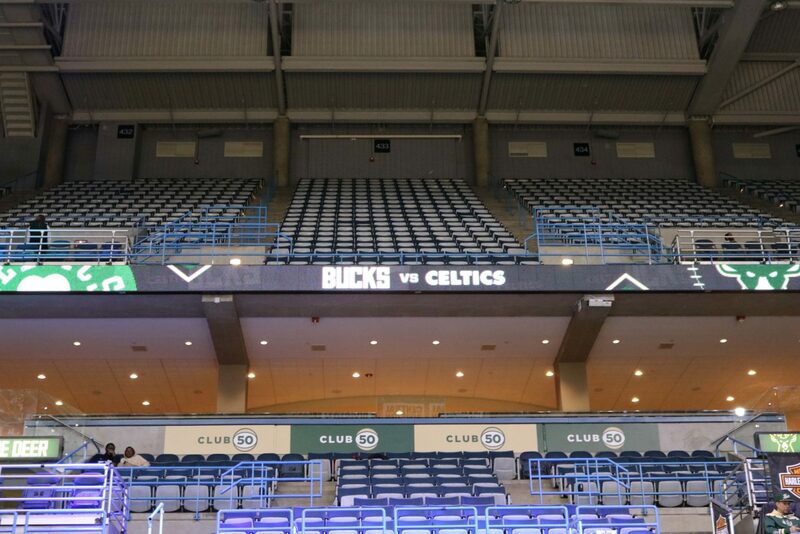 The construction team even used 1980s computer technology to map out seating for optimal views. When Jane Pettit decided to gift the arena, she wasn’t simply paying respect to her father’s legacy. Pettit was also aiming to please her husband. 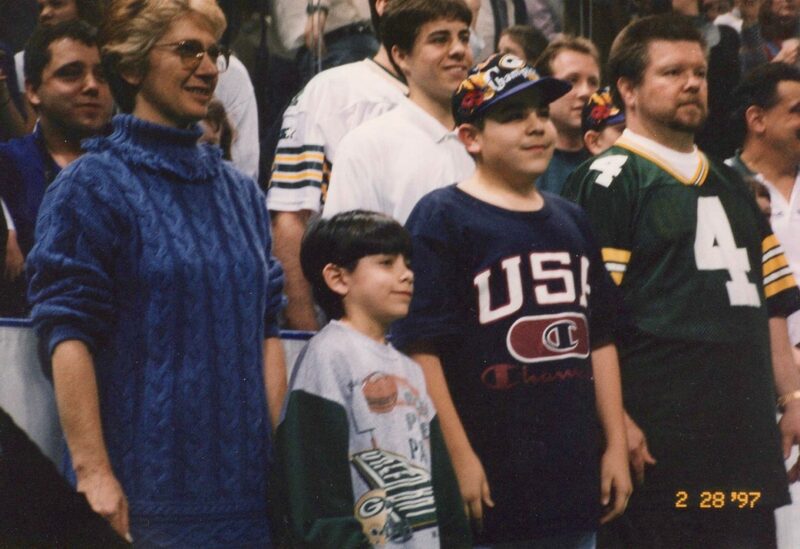 Lloyd Pettit was a former Chicago Blackhawks announcer who dreamed of bringing an NHL franchise to Milwaukee. 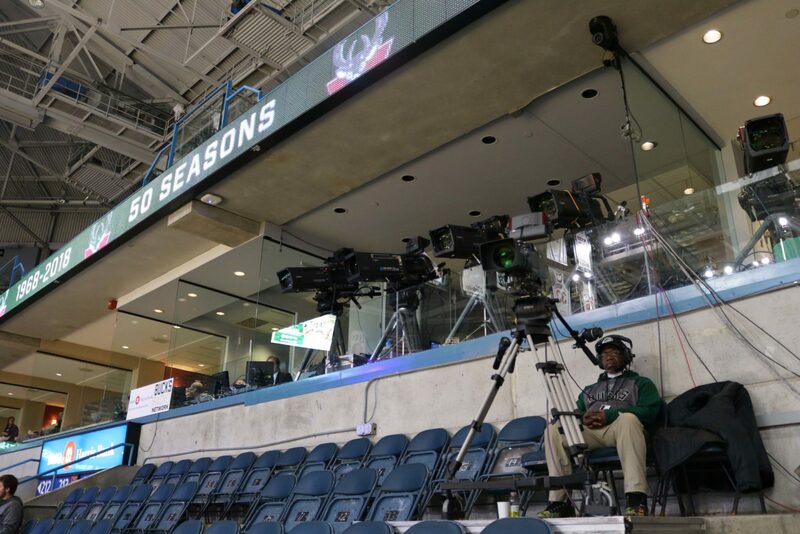 Ice hockey was wired into the Bradley Center’s architectural DNA. 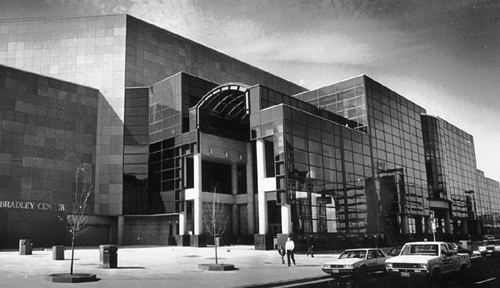 The inaugural event was an NHL exhibition game between the Chicago Blackhawks and the Edmonton Oilers on October 1, 1988. 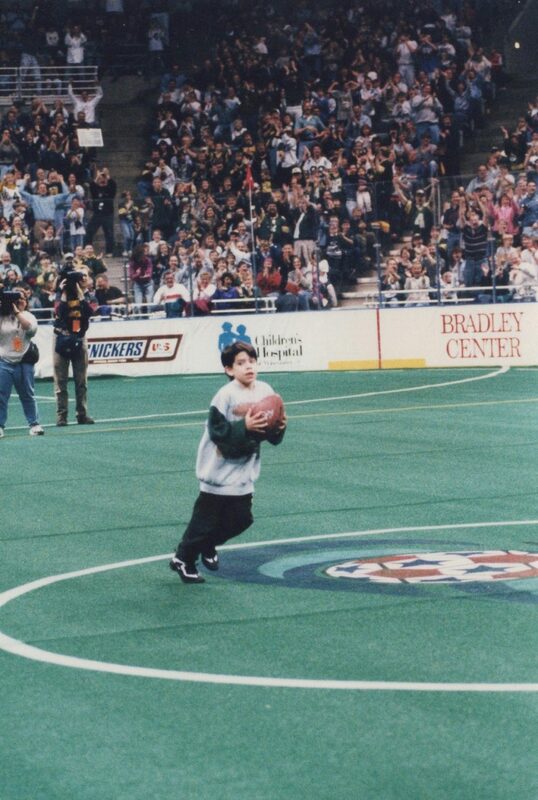 The Pettit’s NHL dream was never realized, but between the minor league Milwaukee Admirals and numerous college tournaments, the Bradley Center saw its share of slap shots and body checks. 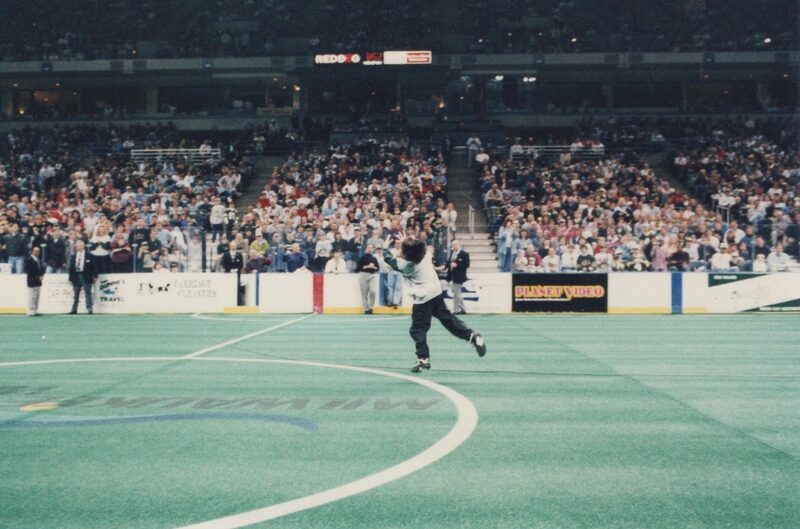 Other sports teams that played in the Bradley Center were the Milwaukee Wave, an indoor soccer club that won the most championships in the building, as well as the Milwaukee Mustangs, an arena football team. 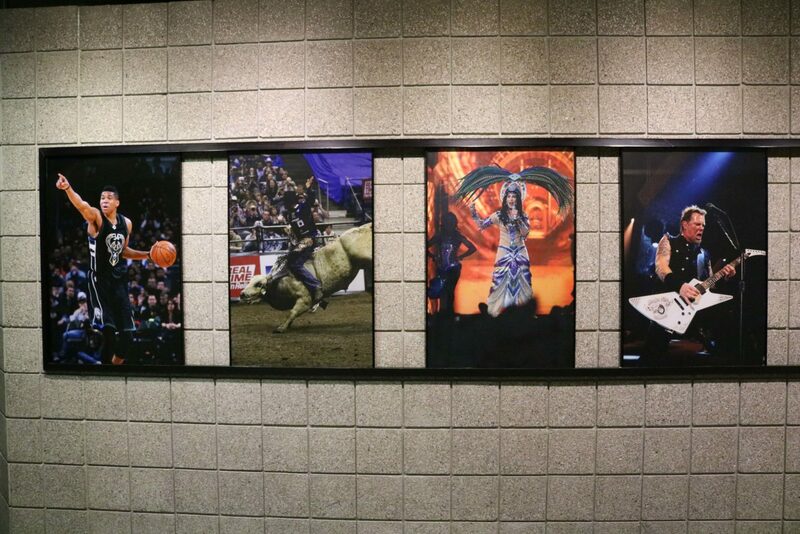 Not to mention, the arena hosted Olympic gymnastics, professional wrestling, monster trucks, motocross and more. 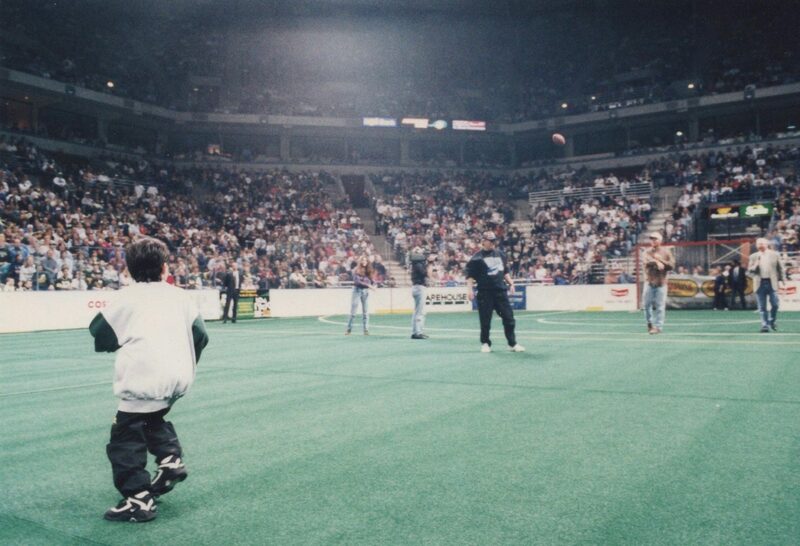 The Bradley Center staged an array of family entertainment, which I regularly attended in the 1990s. 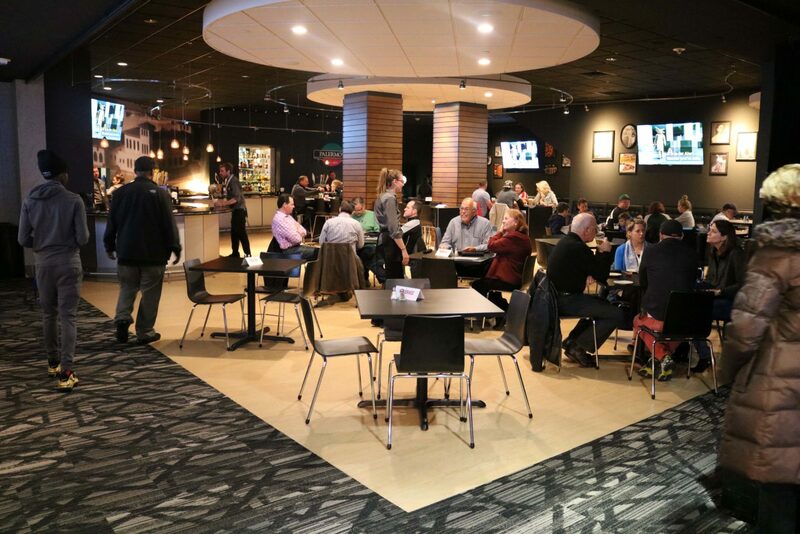 The arena also had a strong philanthropic mission, supporting local nonprofits by giving them concession revenue donations and access to the arena for free. 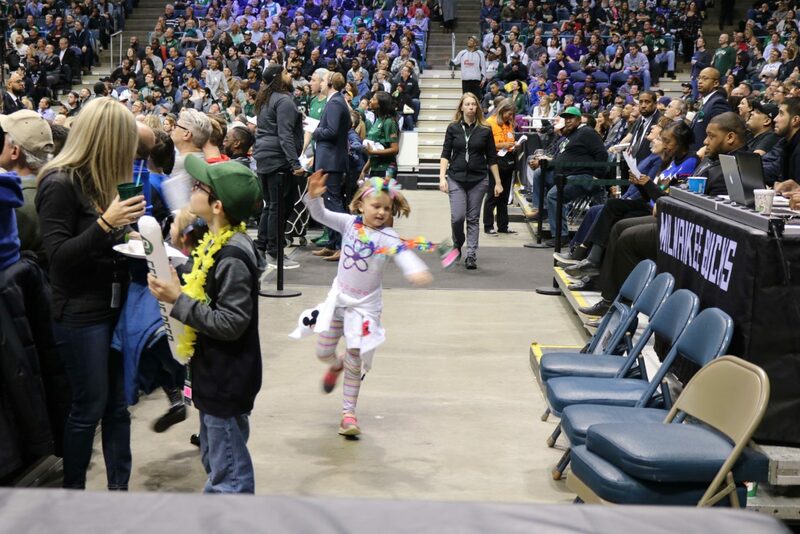 The last time I was at the Bradley Center, a thousand schoolchildren put their dance skills to the test at the Mad Hot Ballroom competition. 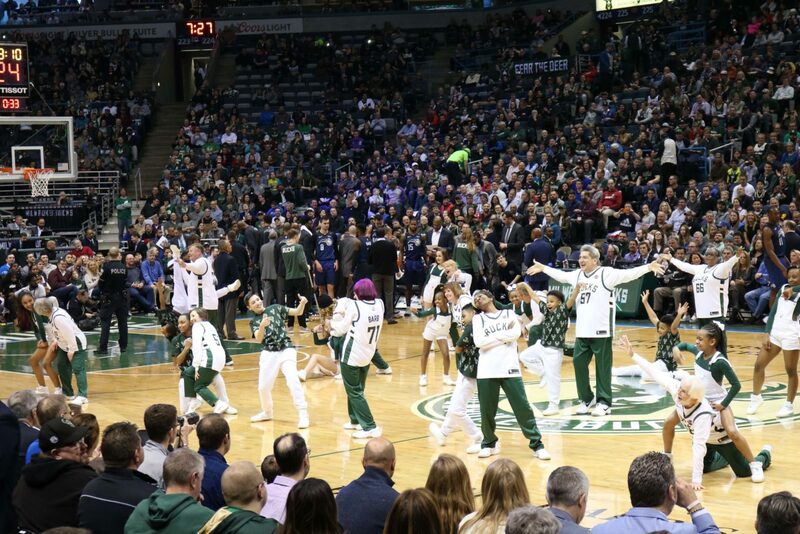 It was the 12th year that the Danceworks and Milwaukee Public Schools event was held at the Bradley Center. “I felt a little nervous at first,” Benjamin Franklin School student Malachi Walker told me in the lobby after nailing his routine, a wide smile stretching across his face. 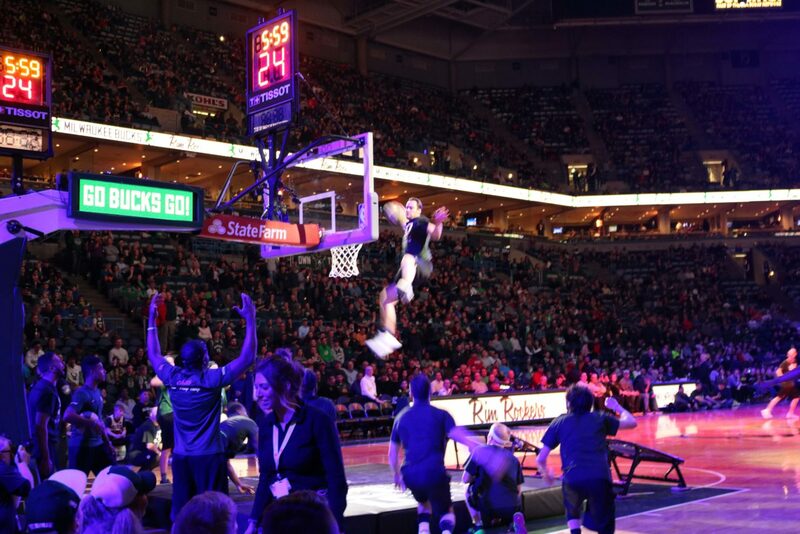 As the choreography unfolded on the floor of the Bradley Center, I noticed a stage set up on the north end for a Marquette University graduation. This made me think of all the scholars, young and old, who walked across that stage, the next chapter of their lives awaiting them on the other side. 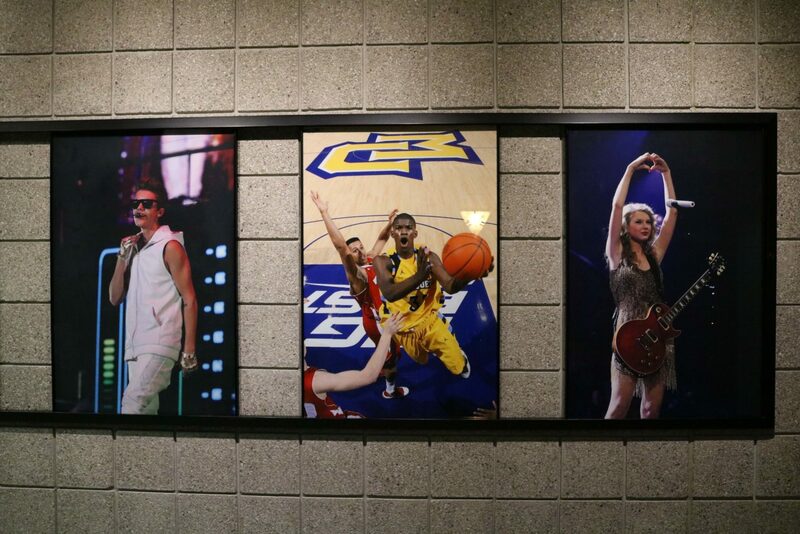 The Marquette men’s basketball team was an iconic resident of the Bradley Center, playing at the arena for 30 years. 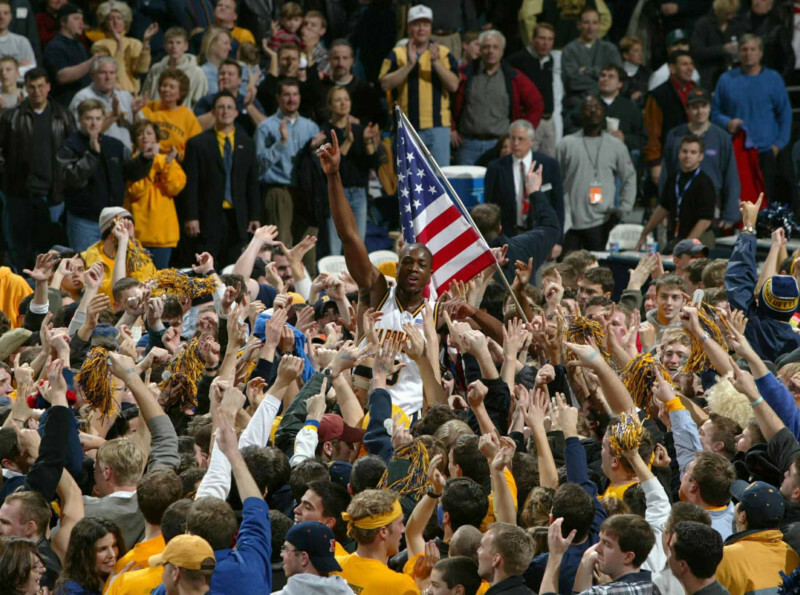 The Golden Eagles mounted many memorable campaigns during that period, with the 2003 Final Four run being the most exciting. 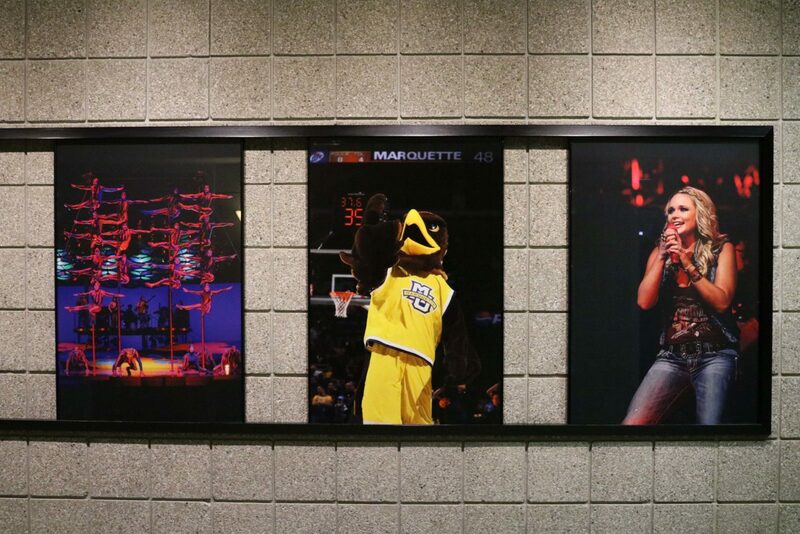 Dwayne Wade is the center of attention as Marquette beat Cincinnati and became the 2003 Conference USA Champions at the Bradley Center. 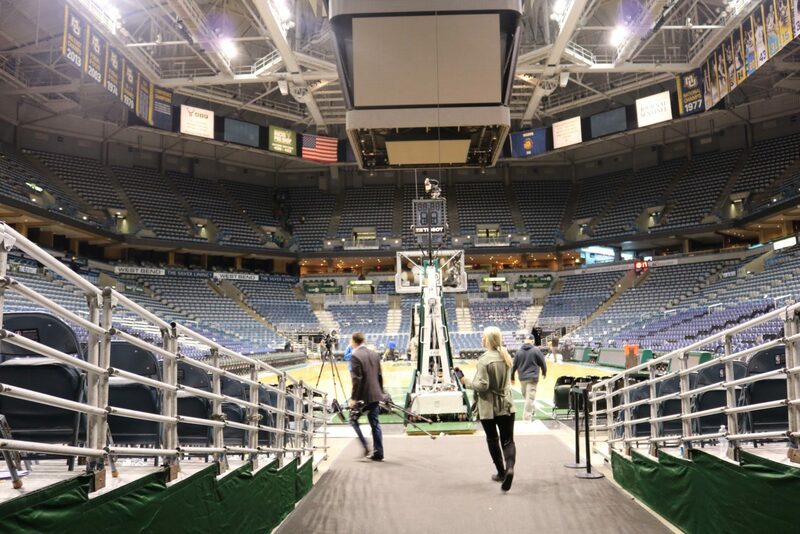 No organization spent more time at the Bradley Center than the NBA’s Milwaukee Bucks. 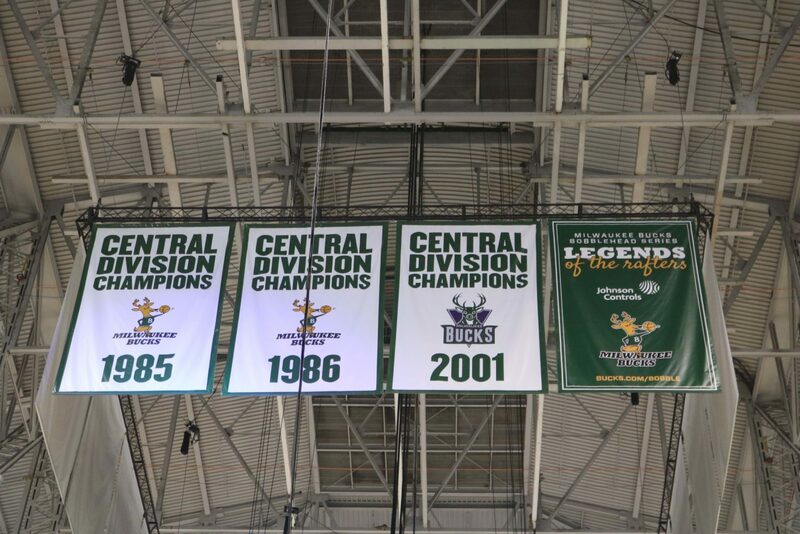 Unfortunately, the team couldn’t match the quality of play from their days at The Mecca, which included 12 division titles, two conference titles, and one World Championship in 1971. 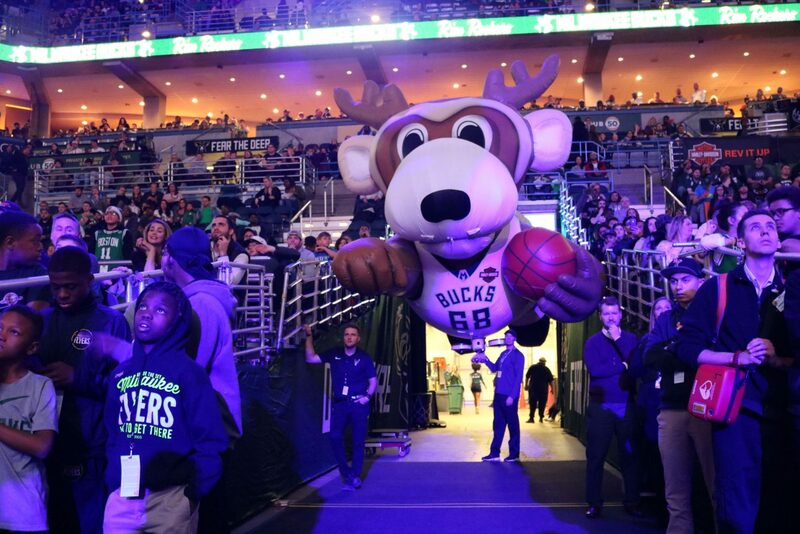 The 2000-2001 Bucks were on the brink of greatness, falling one game short of the NBA Finals. 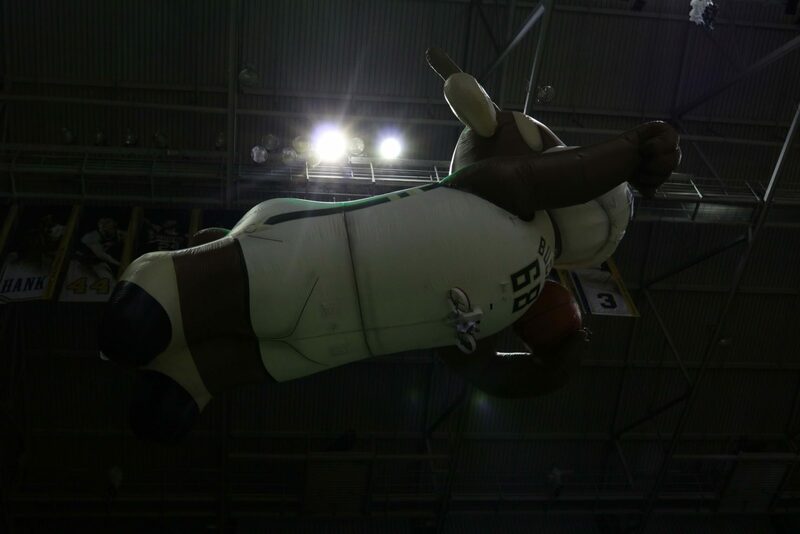 Since 2003, the Bucks have occasionally been overshadowed by the team’s lovable, acrobatic mascot Bango, and the high-flying, eye-popping dunks of the Rim Rockers. 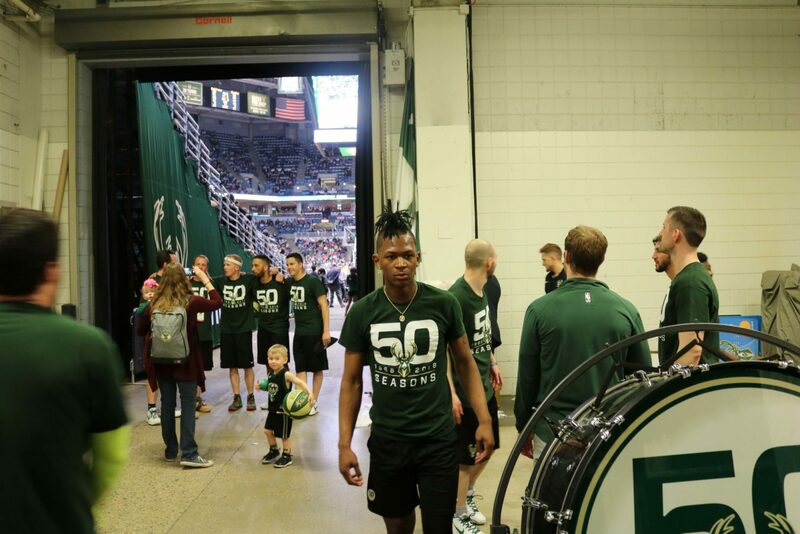 I spoke with the Rim Rocker’s founder, Josh “J$” Schedler, in the tunnel after a reunion performance late last season. 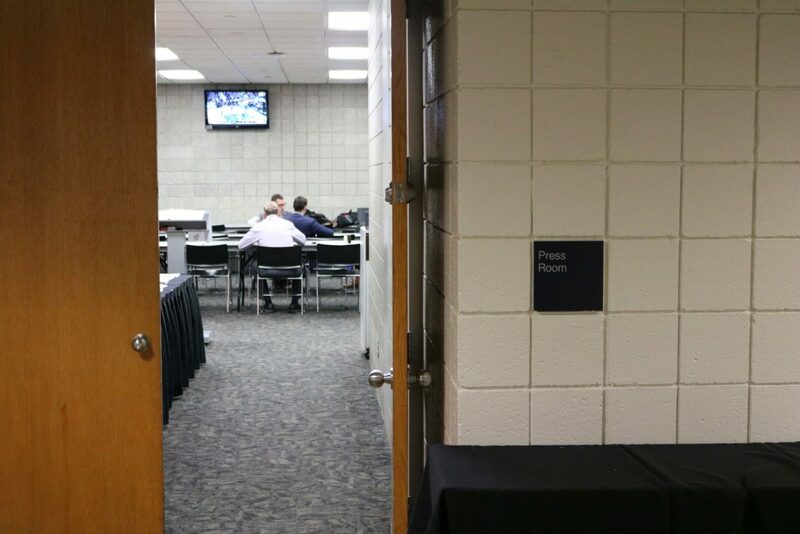 Earlier that evening, I eat dinner with the Bucks press corps. 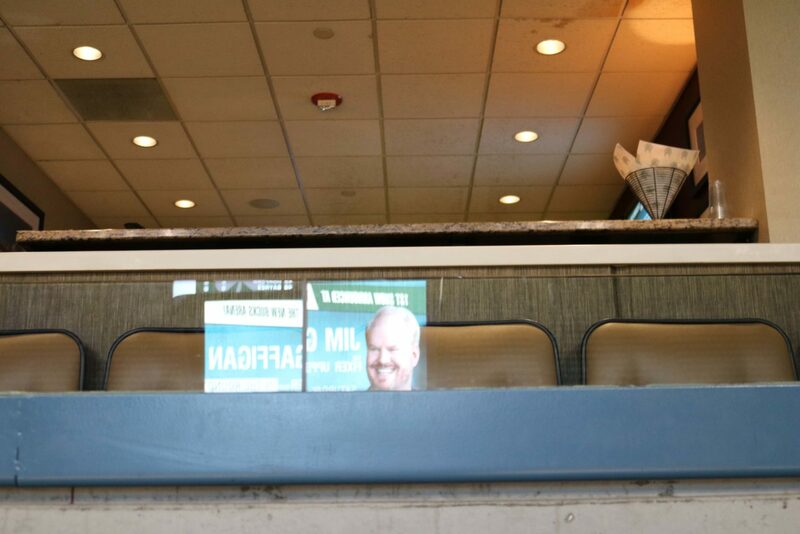 I happen to sit next to the broadcasting core of Jim Paschke, Ted Davis and Jon McGlocklin. 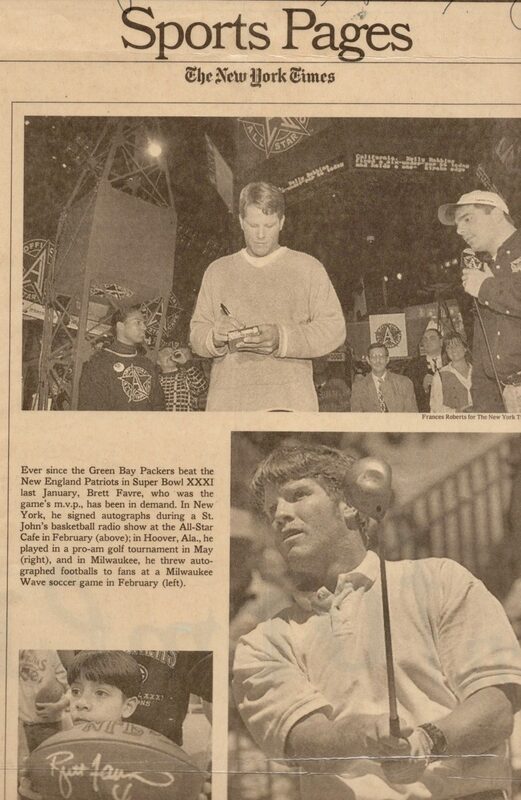 McGlockin was a member of the 1971 World Championship team and has done TV announcing with Paschke for over 30 years. 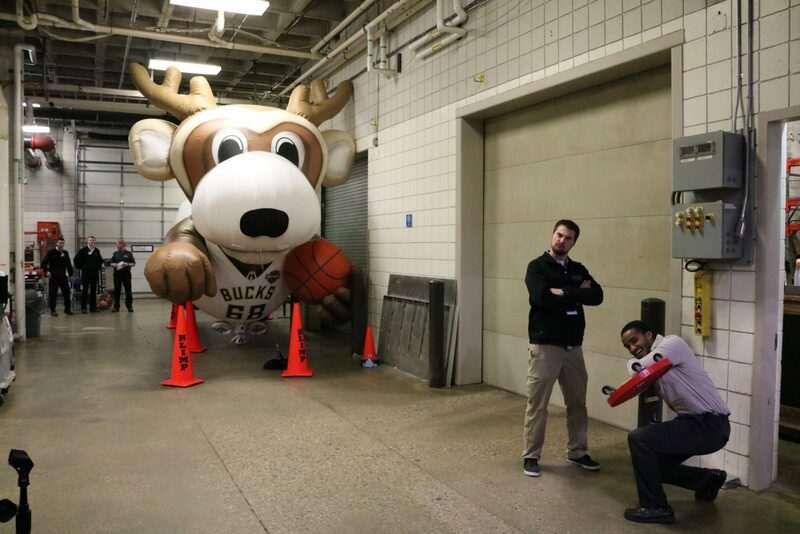 Davis has been the Bucks radio announcer since 1997. 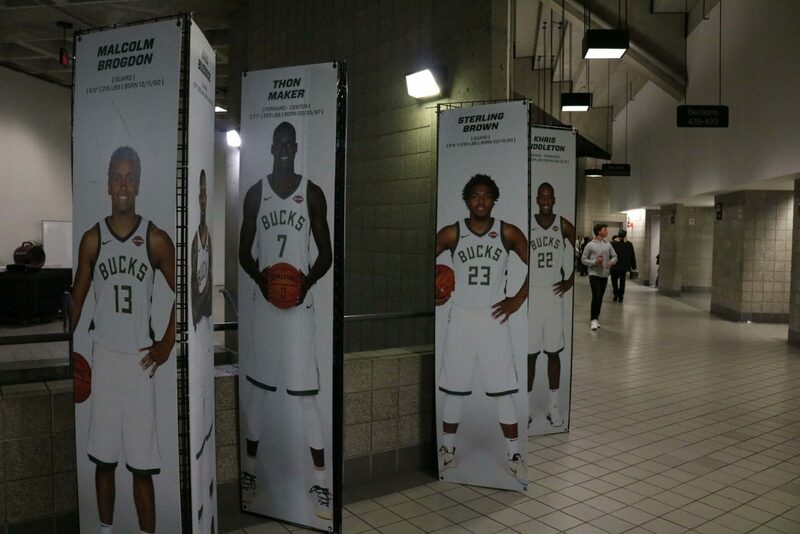 I ask what they will remember most about the Bradley Center when it’s gone. 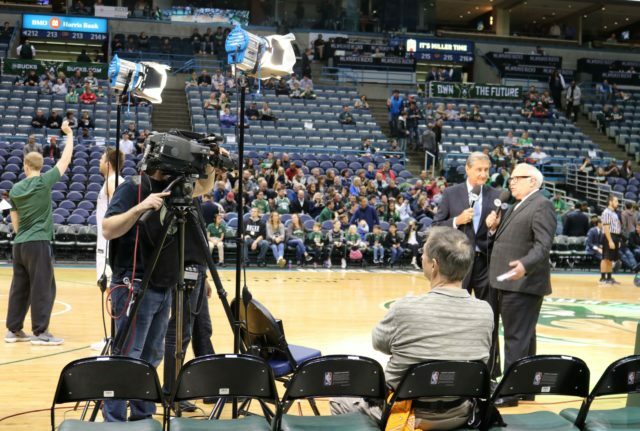 Jon McGlocklin and Jim Paschke deliver a pre-game report at the Bradley Center. 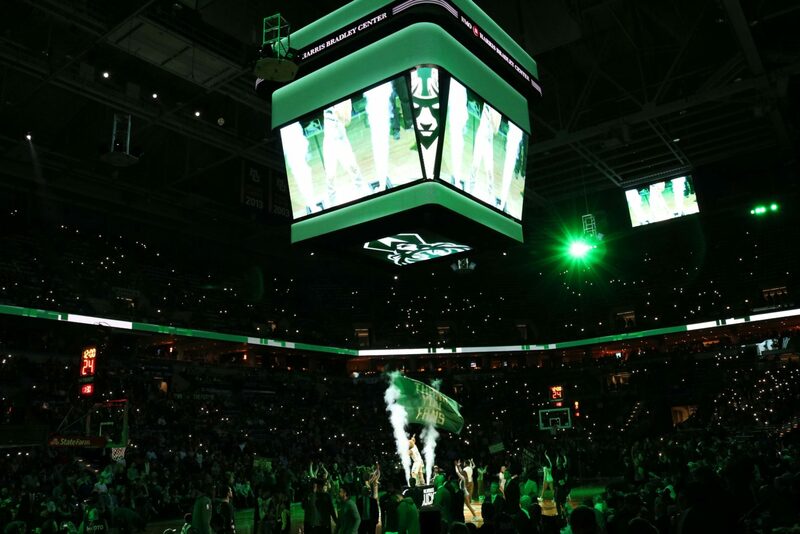 “That 2001 playoff run, Game 7 against Charlotte and Game 6 against Philly were the loudest buildings I’ve ever heard. 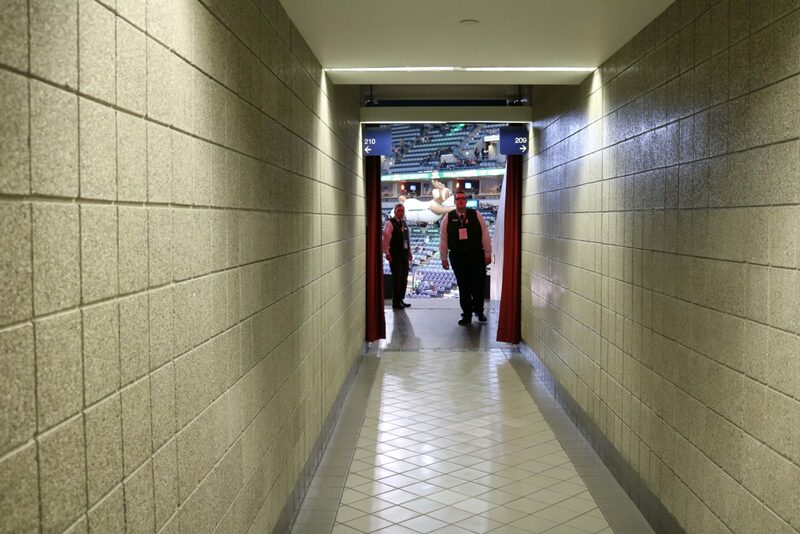 When Wisconsin beat Oregon here a couple of years ago, people told me it was the loudest building they’d ever heard. 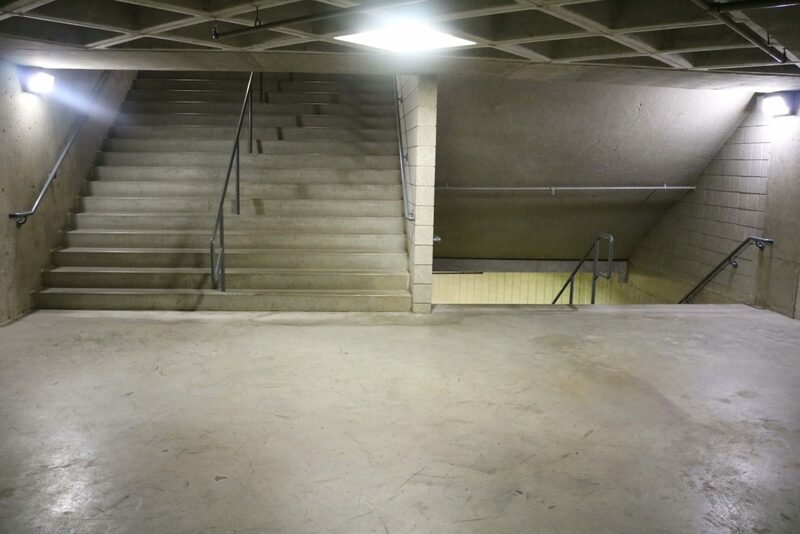 This building could be incredibly involved and loud when a big game was played here,” adds Davis. 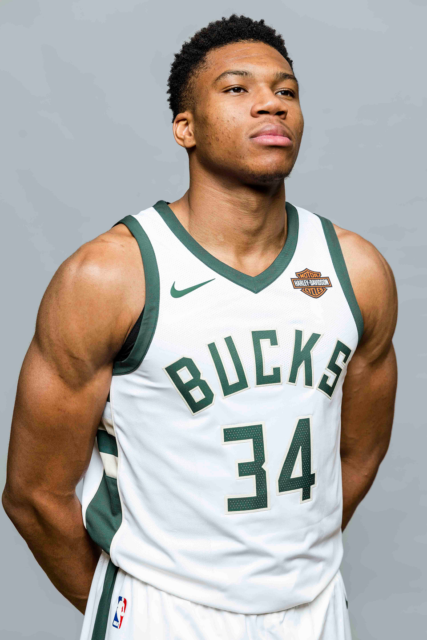 Later that evening, after the Bucks beat the Celtics in their final regular season matchup before meeting in the playoffs, I head into the locker room to interview 23-year-old Greek phenom Giannis Antetokounmpo. 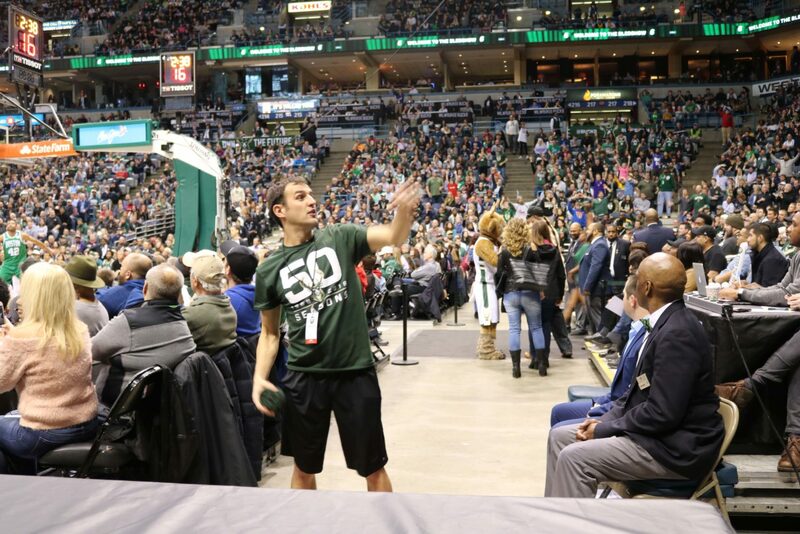 The Bucks star player’s charming naiveté is on full display during our brief one-on-one conversation. 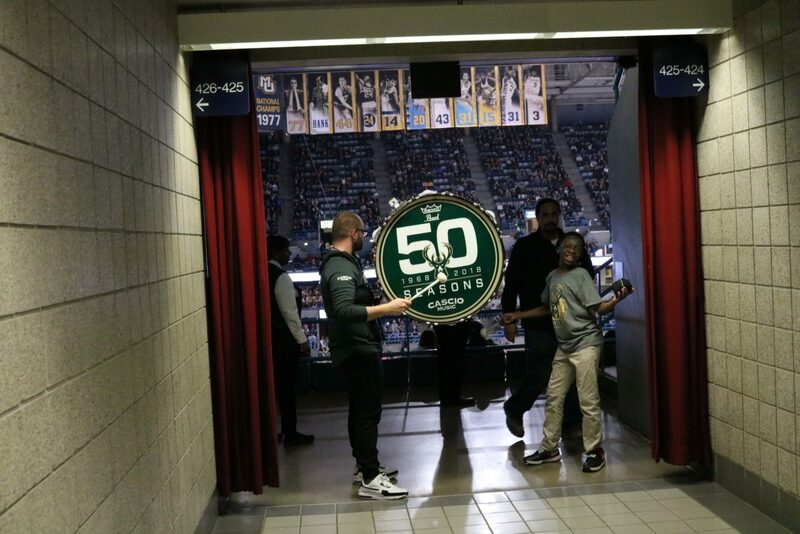 When I ask him what he will remember about the Bradley Center once it’s gone, he squints his eyes, jerks his head and jumps back. 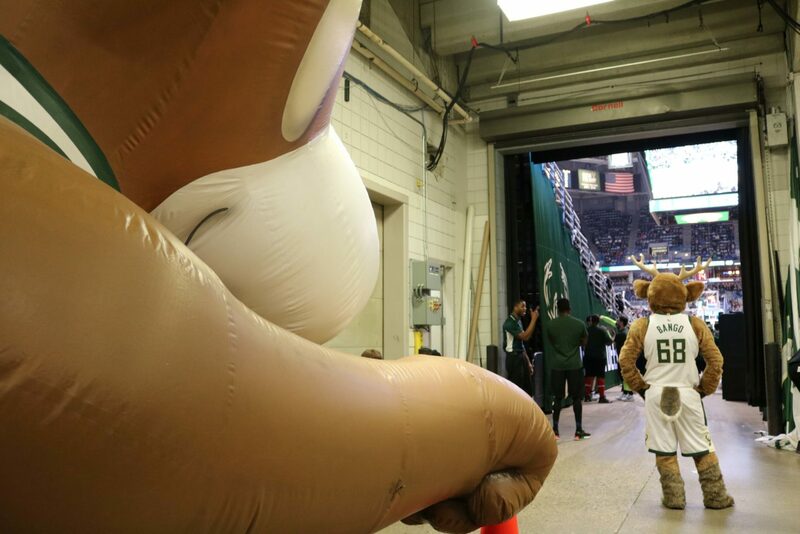 Apparently, I am breaking the news to Giannis that the Bradley Center is slated for demolition. 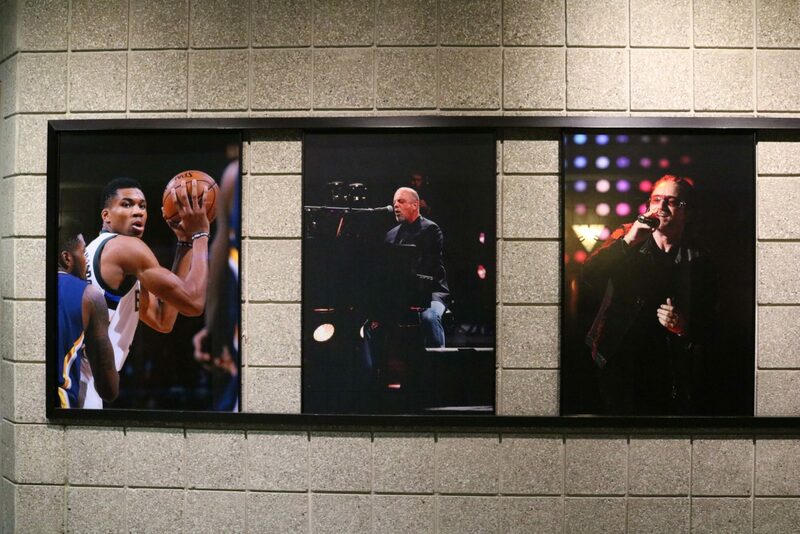 The two-time NBA All-Star regains his composure. 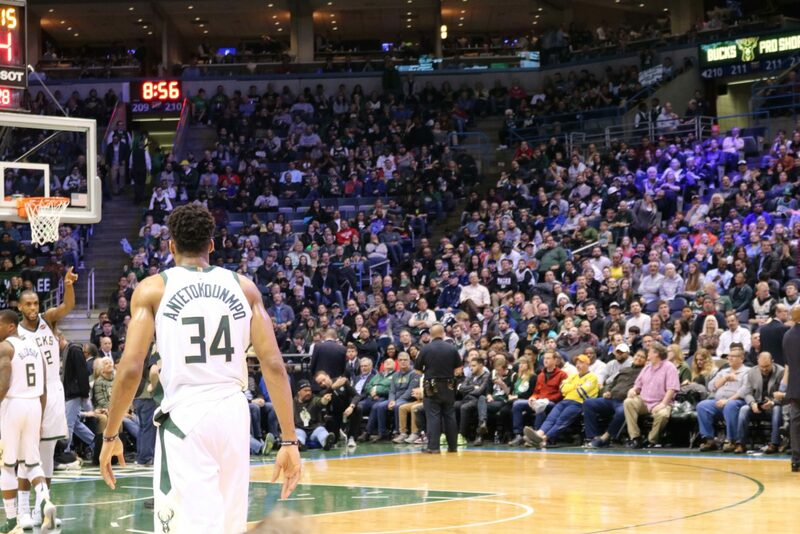 I ask Giannis if he can recall his thoughts and feelings the moment he first stepped into the Bradley Center. 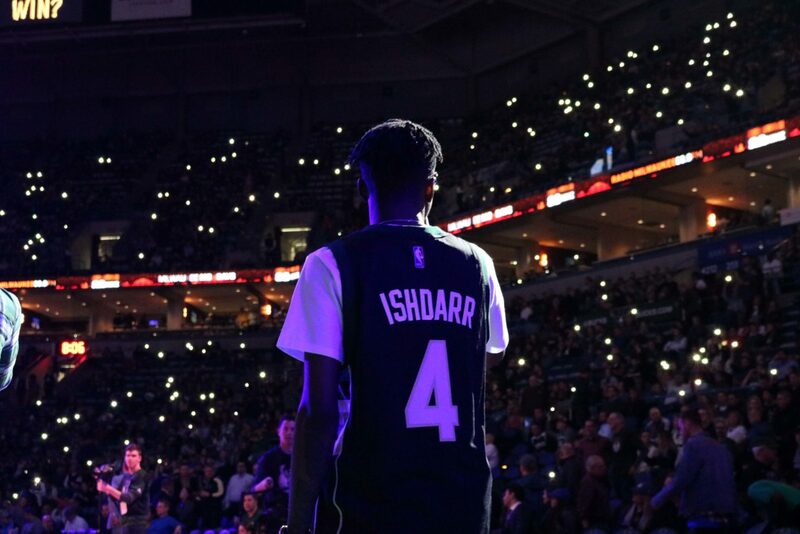 Another young buck putting Milwaukee on the map is 21-year-old rapper Ishmael “IshDARR” Ali. 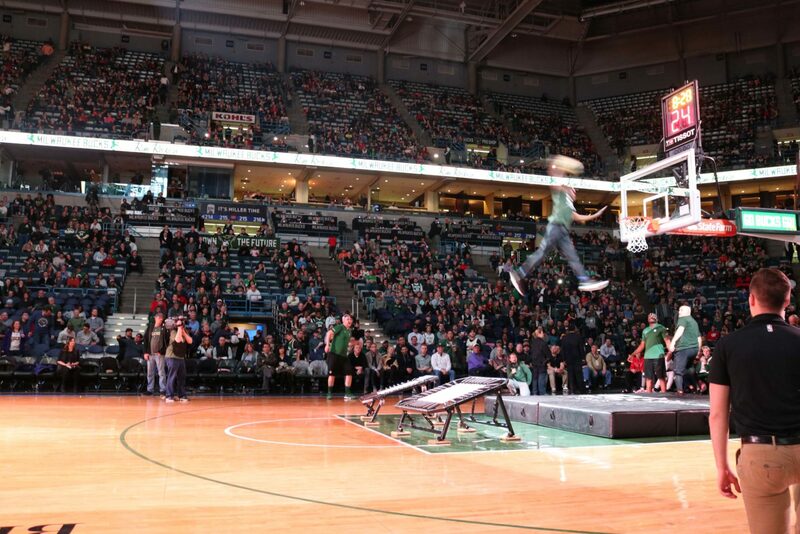 On April 9, the Messmer High School graduate performed at halftime of the Bucks final regular season game at the Bradley Center. 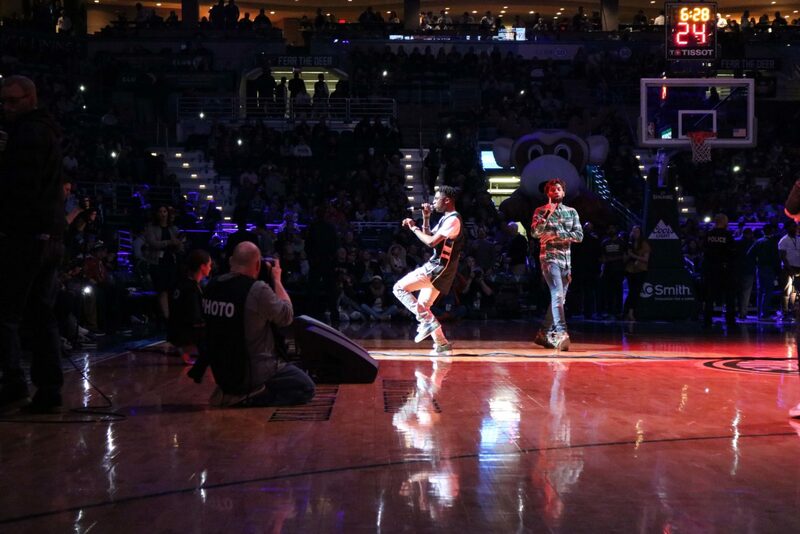 This wasn’t Ali’s first time on center court, as he had done another halftime performance the year prior and shot a music video inside the arena. 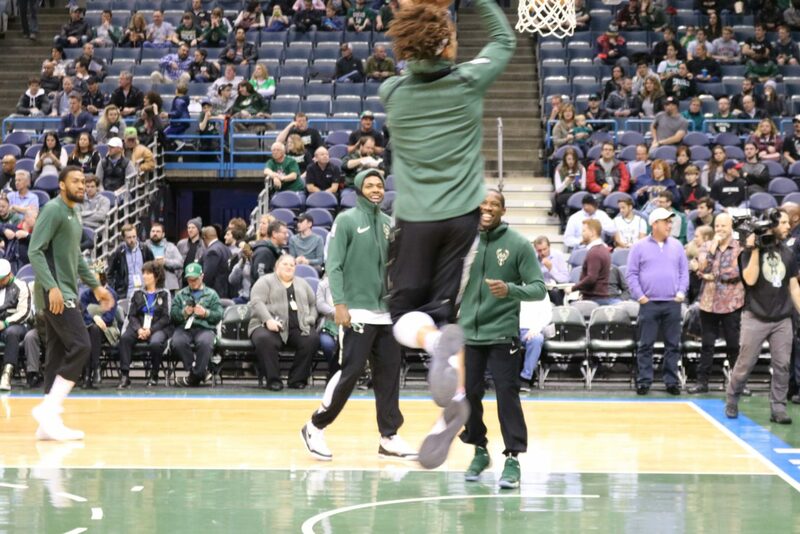 While Milwaukee is one of the most segregated cities in America, it didn’t feel like it when you were at a Bucks game at the Bradley Center. 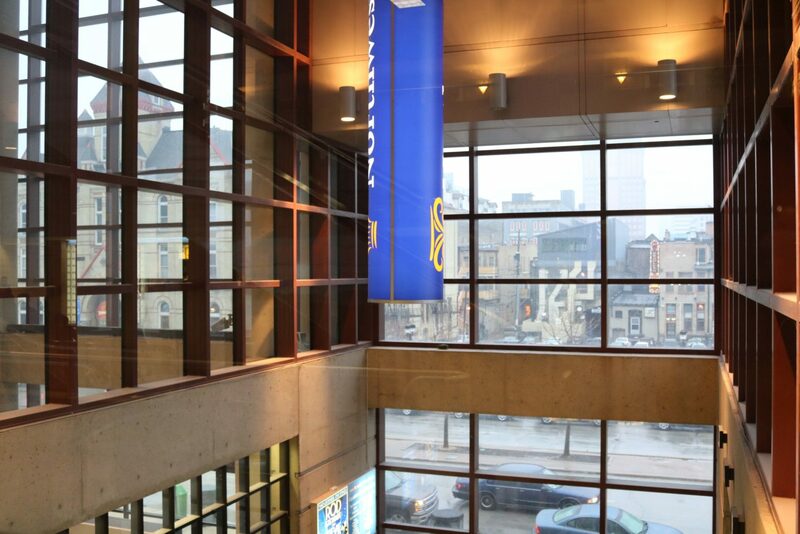 In fact, I can’t think of any other building in the city where so many different people came together under one roof. 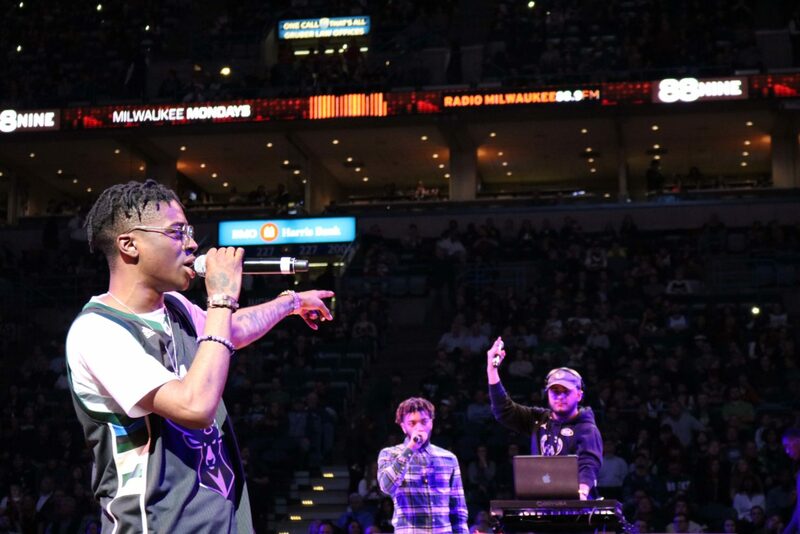 Tyrone “DJ Bizzon” Miller—a mentor, community worker and DJ—was one of the first people to play IshDARR’s music on the radio. 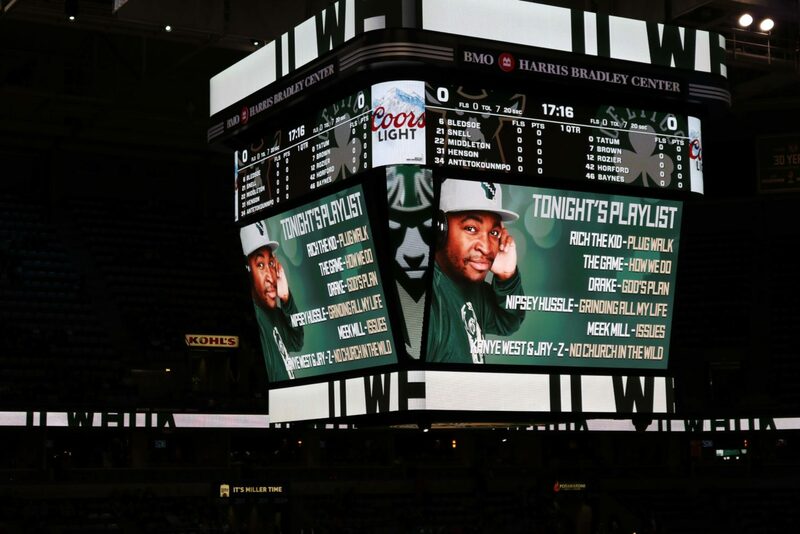 In recent years, Miller became a part of the Bucks Entertainment Network, DJing in the atriums before games. 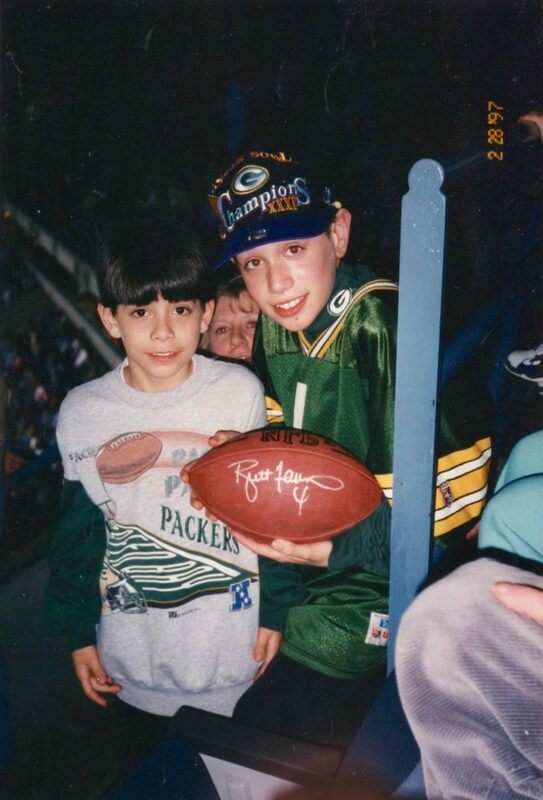 As far as hometown sporting triumphs go, I doubt anything will ever top the night the Green Bay Packers won the Super Bowl in 1997. 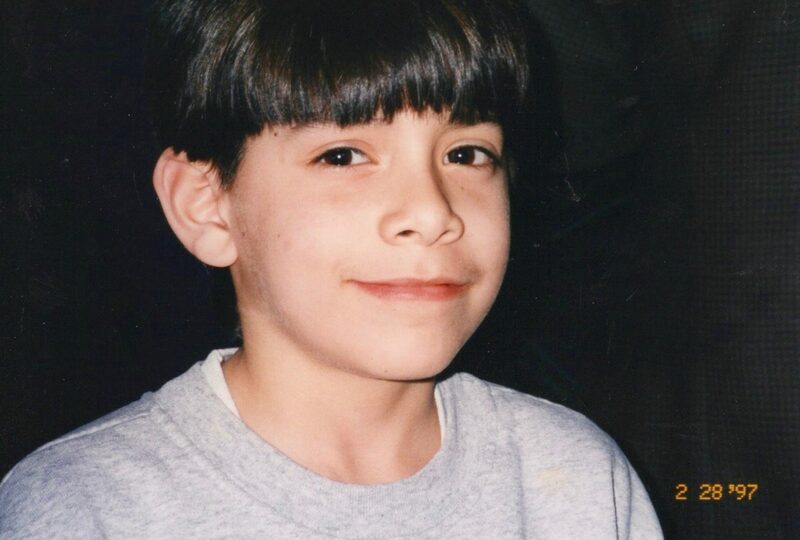 I was 11 years old. My parents were hosting a Super Bowl party and our house was overflowing with people. When the game ended my friends and I ran out into the snow-lined streets, dancing and shouting with joy. 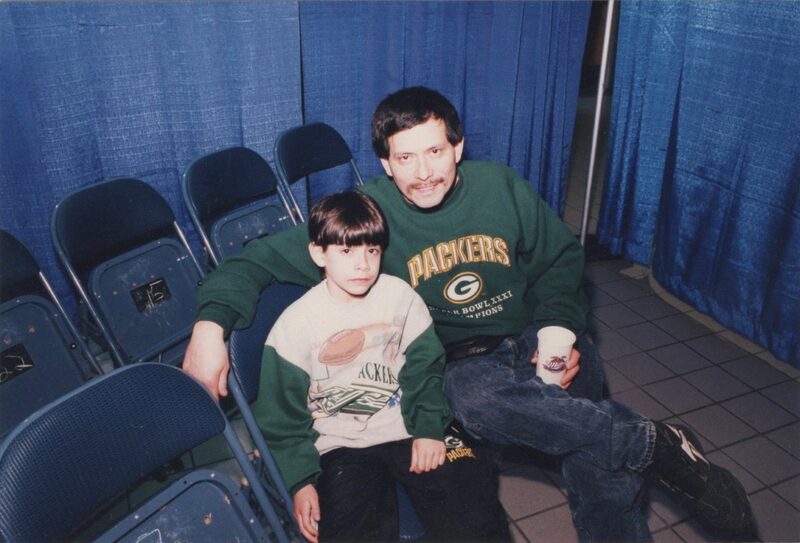 The next day my family bundled up and drove north to welcome our conquering heroes at Lambeau Field. 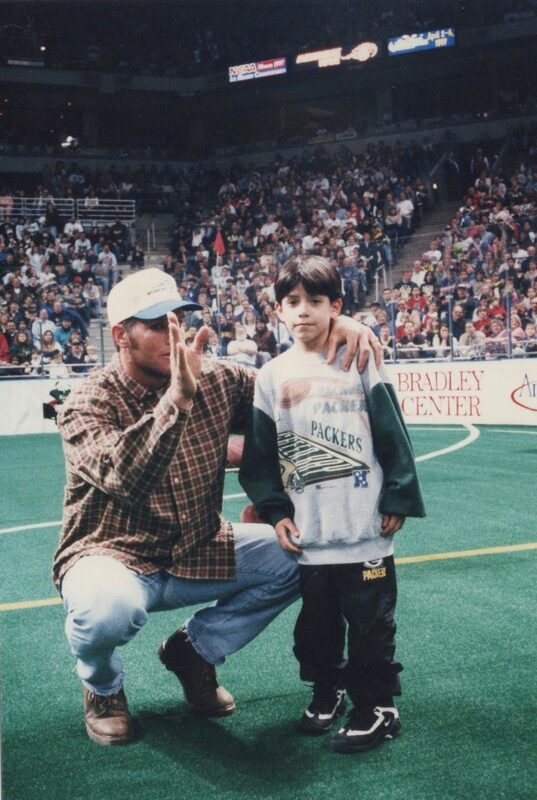 A month or so later, Packers future Hall of Fame quarterback Brett Favre is scheduled to make an appearance at the Bradley Center. 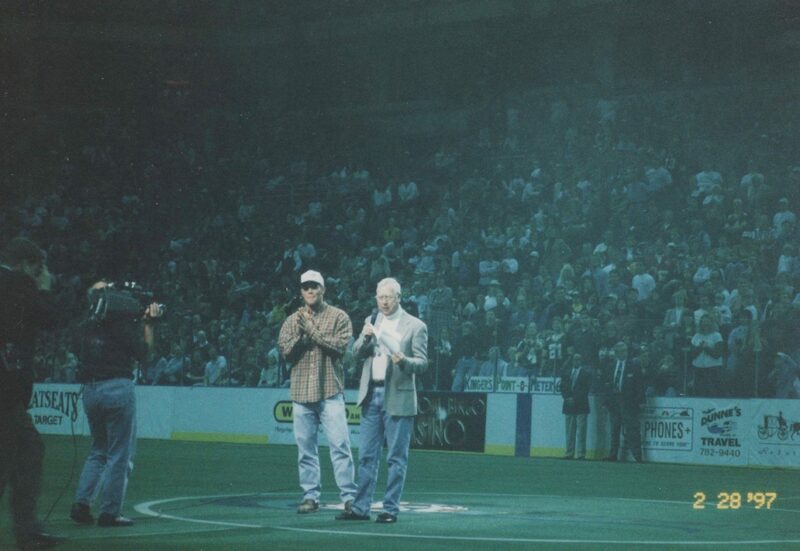 Favre will be throwing autographed balls to 15 lucky fans during halftime of a Milwaukee Wave game. My father manages to get tickets despite the event quickly selling out. 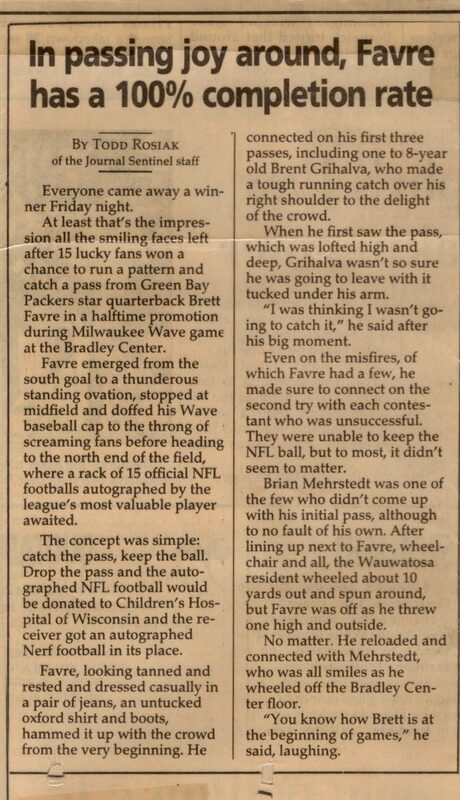 The Wave played some excellent indoor soccer at the Bradley Center, but it’s safe to say that the Brett Favre night was their best attended game. 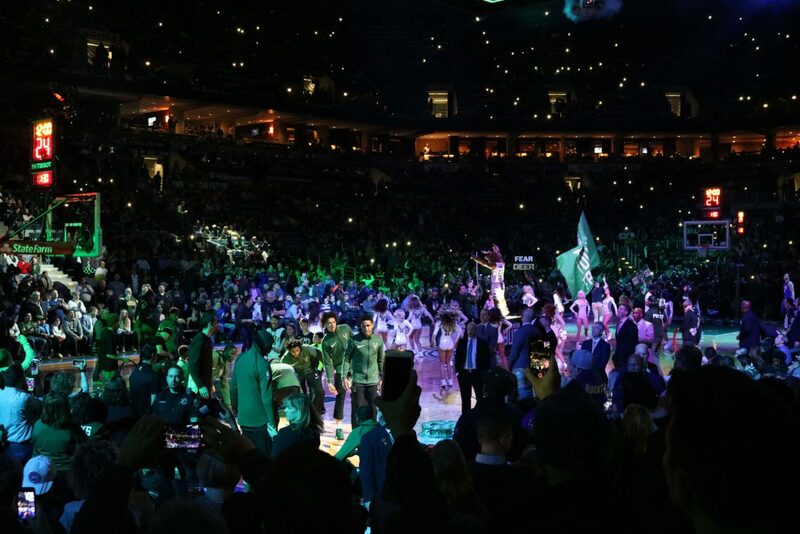 The atmosphere was electric. 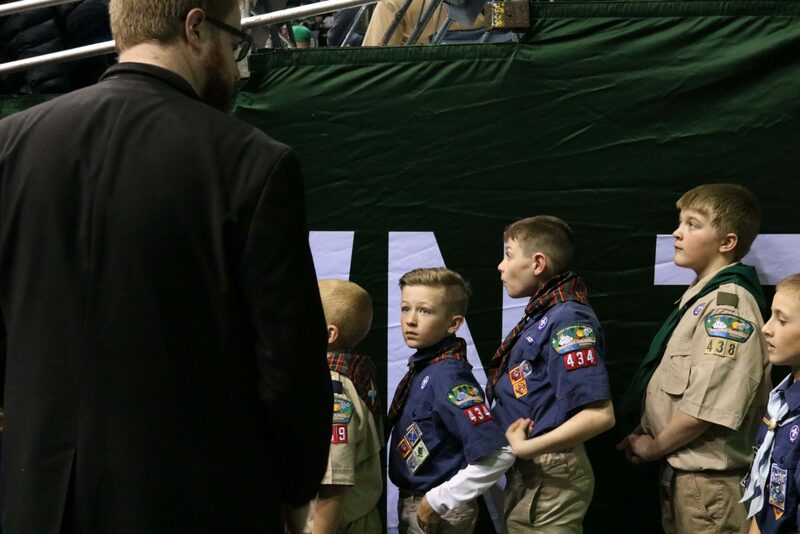 There was a blanket of gratitude in the arena so warm and fuzzy you could almost wrap yourself in it. Early on in the game a woman with a clipboard appears at our seats. She points to my brother Brent, turns to my parents, and asks for him to come with her. She is being very secretive. My heart sinks. In my pocket is the ticket for the seat my brother is sitting in. If only we had been more formal! My brother, however, is unaware of what’s happening. 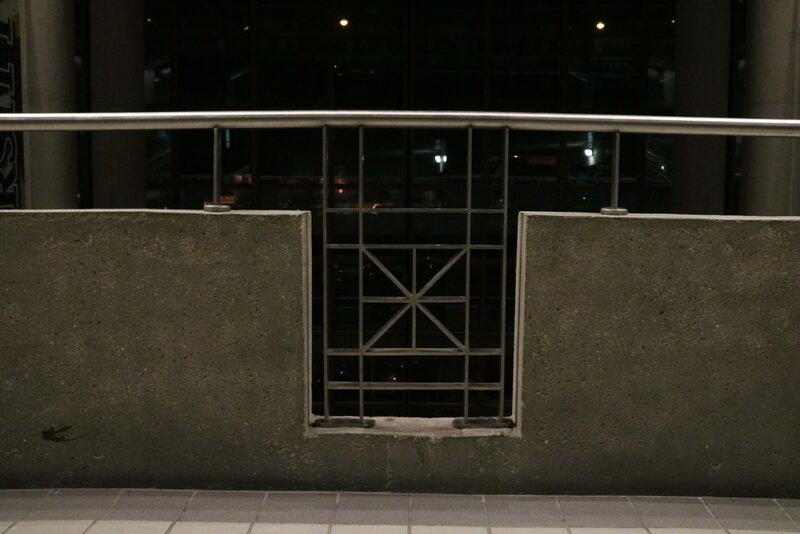 In the north atrium below the stairs my father gives me a pep talk about being supportive of my brother. By that point my raging jealousy has mostly subsided. I have accepted this fate. “I’d probably drop it anyways,” I tell myself. 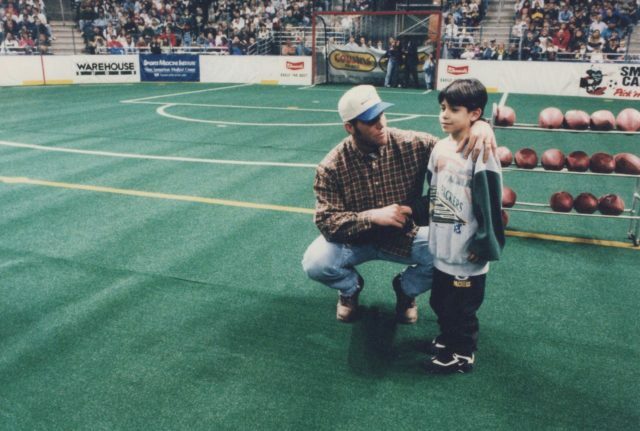 The concept of “One-on-One with Brett Favre” is simple: if you catch the ball, you keep the ball. 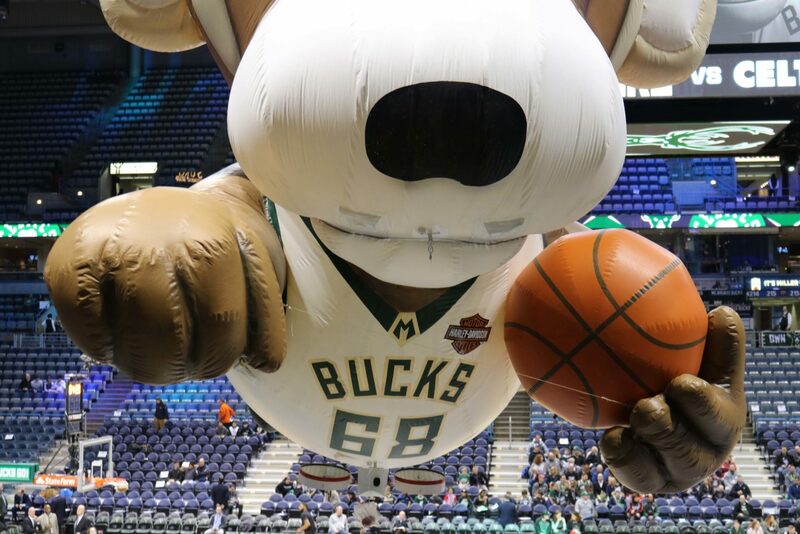 But if you drop it, the ball will be donated to Children’s Hospital of Wisconsin and you get a NERF ball signed by the three-time MVP. 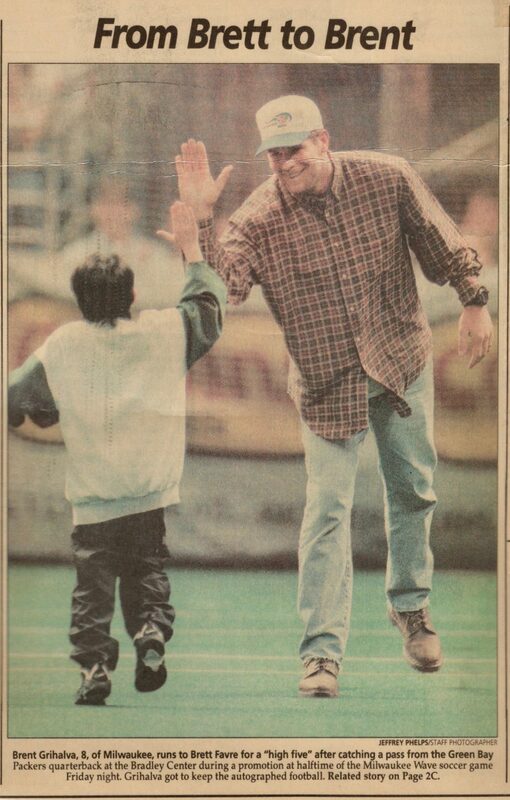 Brett Favre in the huddle with 8-year-old Brent Grihalva. 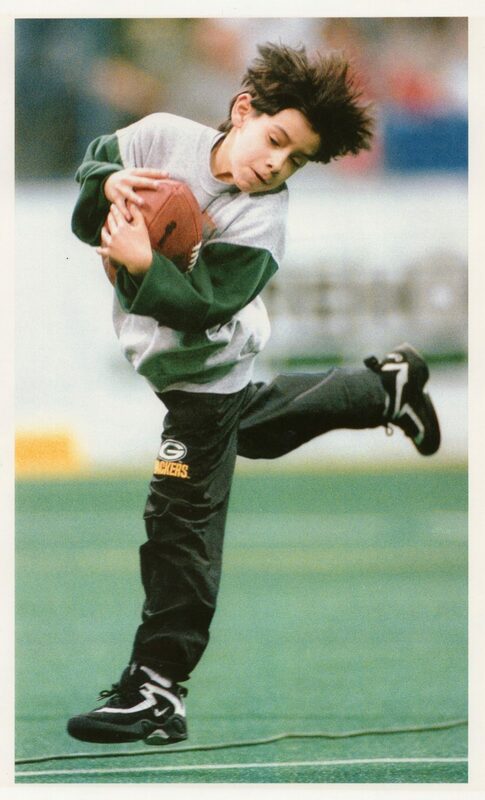 For the little kids, Favre tosses an easy underhand or shovel pass. 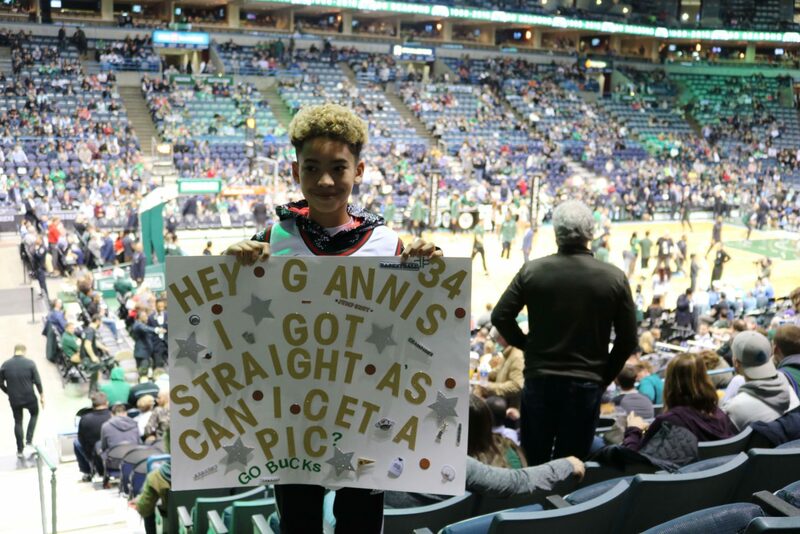 This is not the case for my 8-year-old brother, who he is looking extra little and cute in an oversized Packers sweatshirt. What happens next has been permanently etched into family lore. The ball sails above my brother’s head. 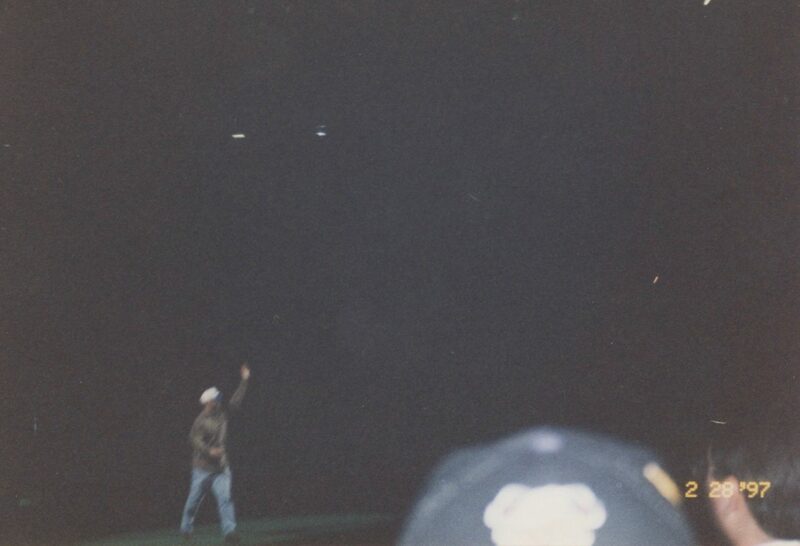 It looks as though Favre has overthrown him by about five yards, but his little legs spring into action, he looks over his right shoulder and throws up his hands. 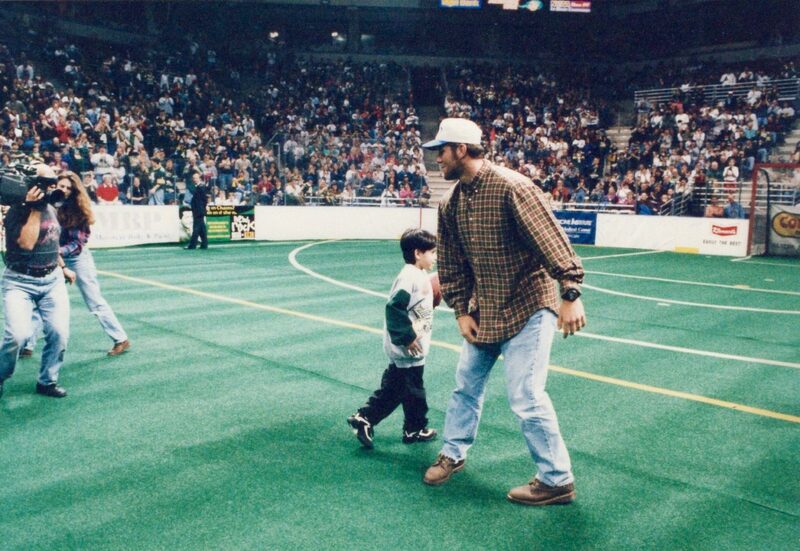 My brother held his stride for a few steps, then turned back to give Favre a high five. 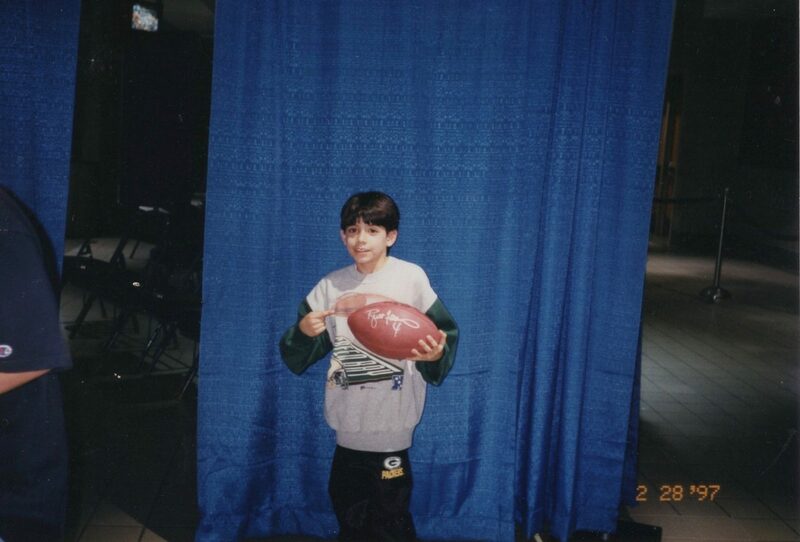 My idol then tousled my little brother’s hair and did the “raise the roof” gesture as Brent walked away. 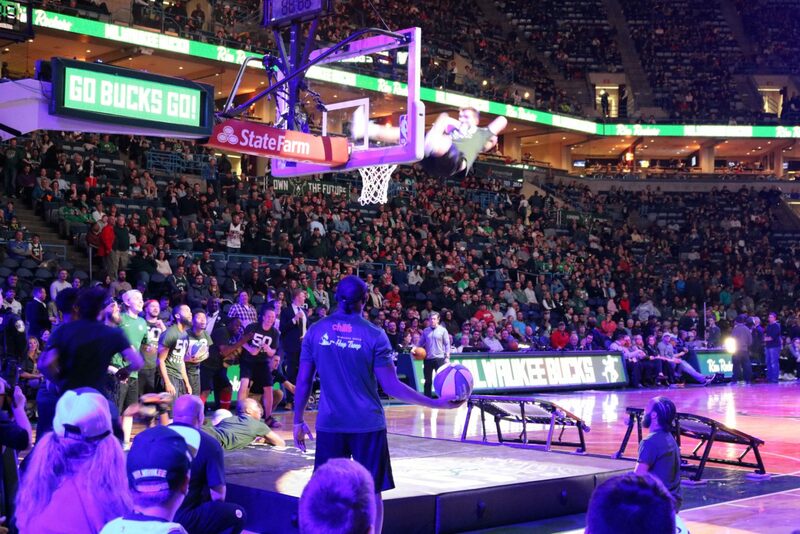 The crowd absolutely lost it. 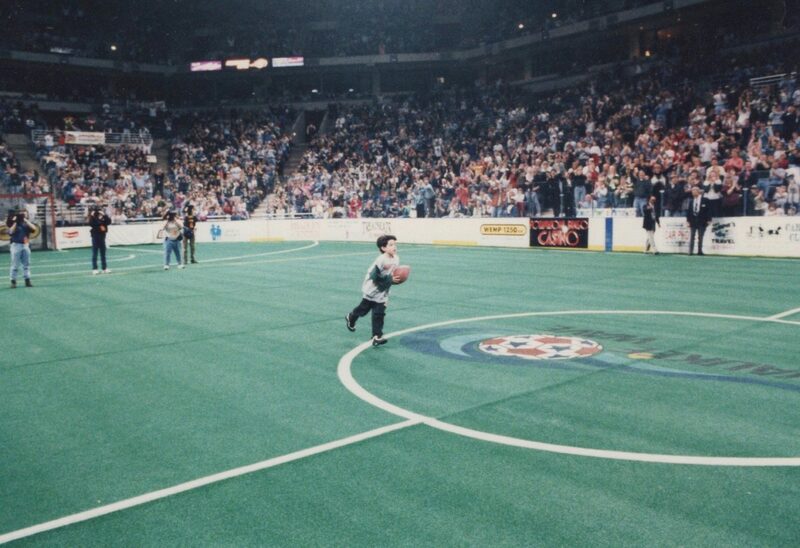 The next day my little brother was on the cover of the Milwaukee Journal Sentinel and a few months later his face was in the Sports Pages of The New York Times. You can watch the catch in the following clip, which I made in 2011 for a short-lived side business. 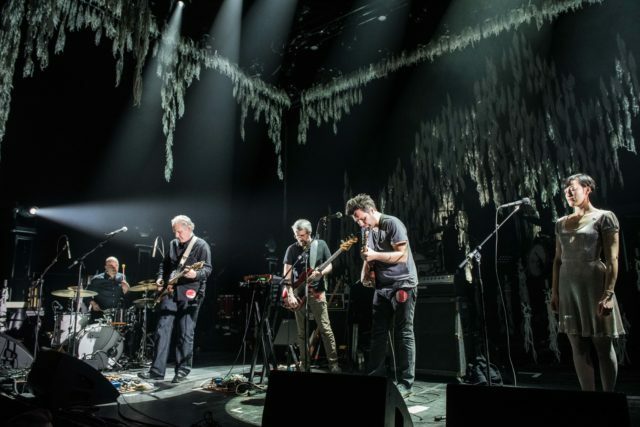 The cavernous arena seemed an odd choice for such an intimate affair, but “For Emma, Ten Year” was a total triumph. 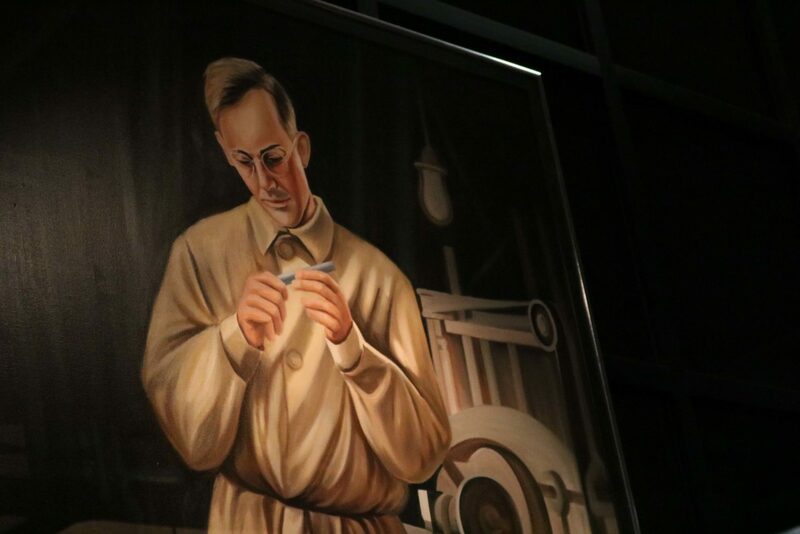 At various points in the show you could hear a pin drop. 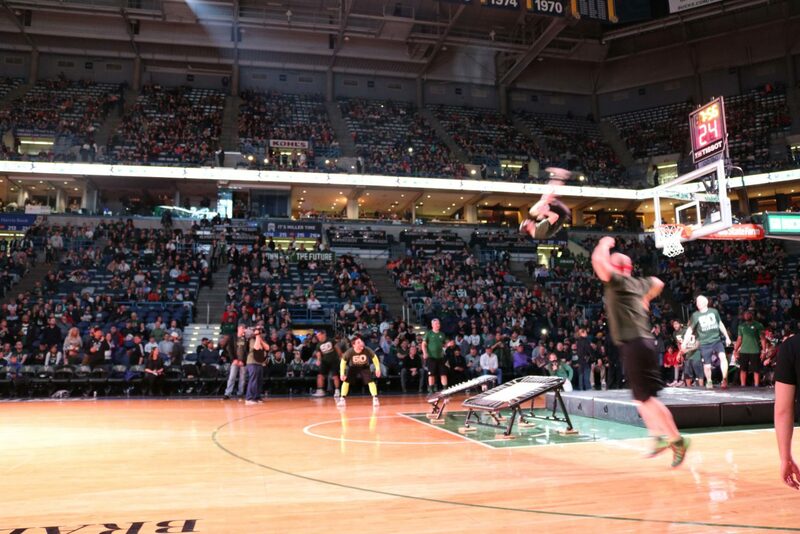 Not to mention, both opening acts hailed from Milwaukee: Field Report and Collections of Colonies of Bees. 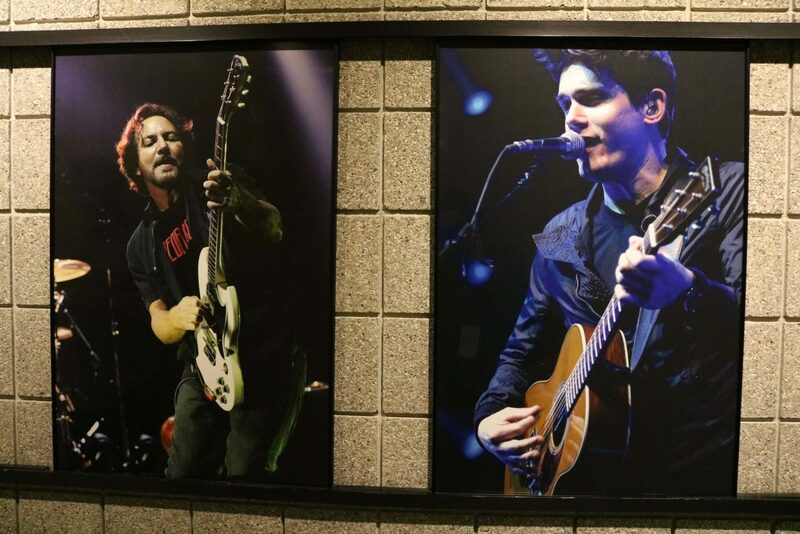 “Ten years ago, almost this exact same bill happened up the road at a place called Mad Planet,” said CoCoBees frontman Chris Rosenau, referring to a club in Riverwest that can fit about 1.5 percent of the people who were at the Bradley Center that night. Bon Iver put on an immaculate performance that night. During Field Report’s set, it was a thrill to see local musicians Christopher Porterfield and Mark Waldoch get their Springsteen on. 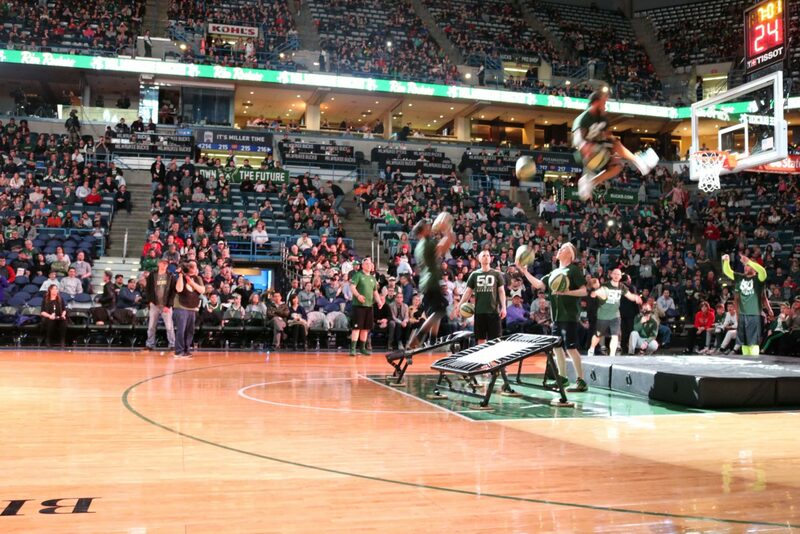 CoCoBees newest member, Marielle Allschwang, debuted choreography during the band’s Bradley Center gig. “To maybe stave off some of my nerves, I brought in Dawn Springer to help me choreograph some movement for the show. 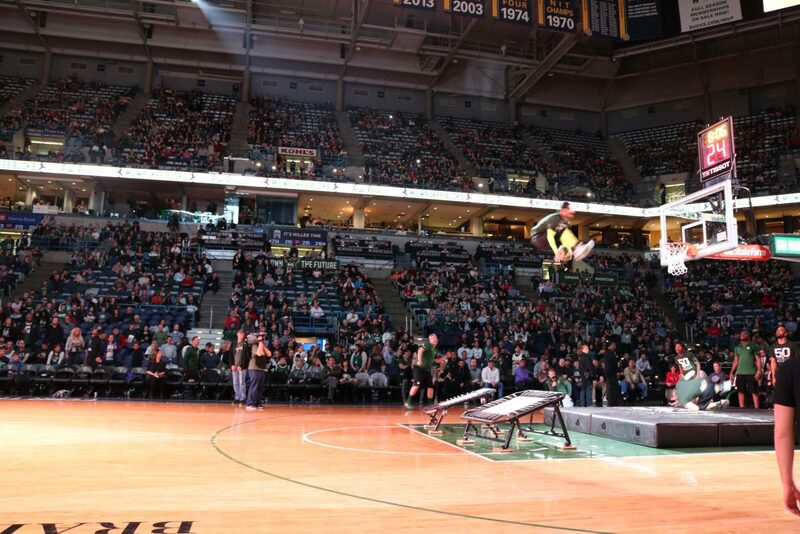 It was really fun to do that in such a gigantic space in front of so many people,” recalls Allschwang. 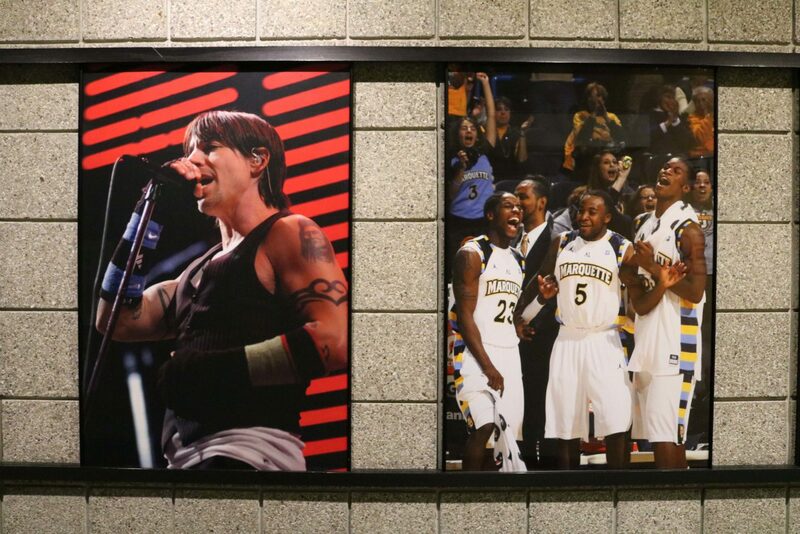 I attended my first ever concert at the Bradley Center in the early 1990s. 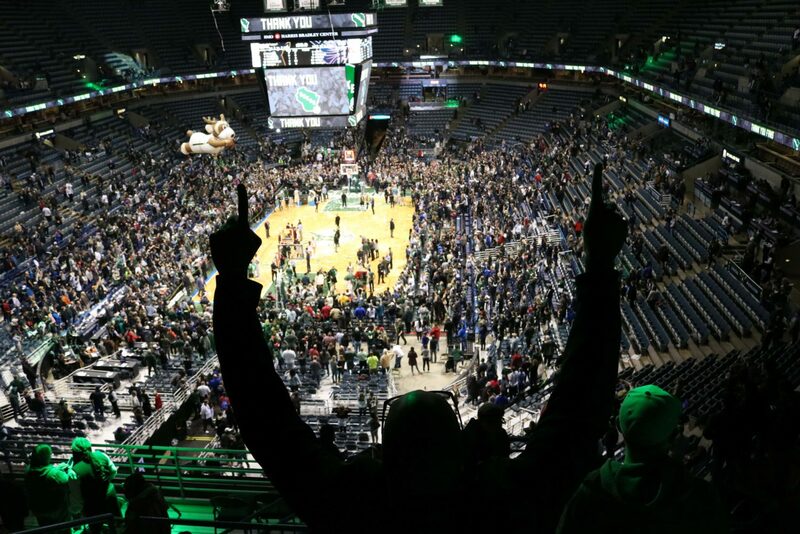 It was after an Admirals game and I can still remember singing along to Eddie Money’s “Two Tickets to Paradise.” I never went to any major Bradley Center concerts as a kid, but I’ve been to a few since moving back to Milwaukee in 2013. 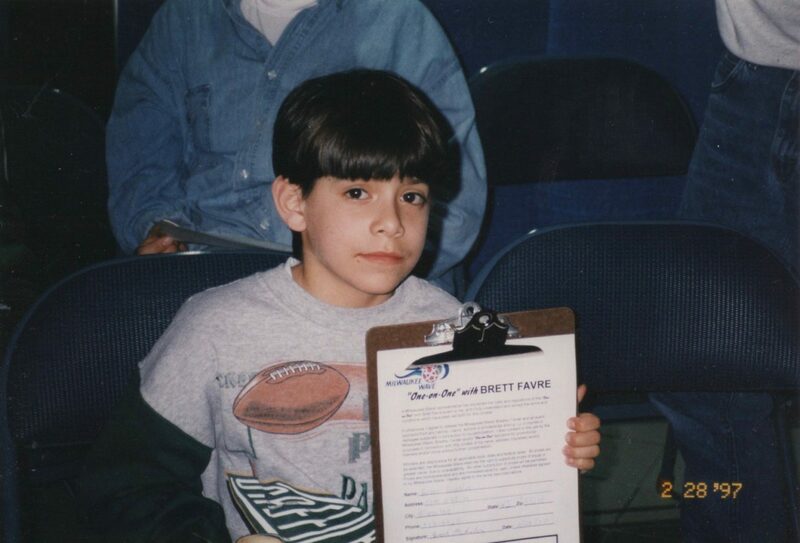 A last-minute ticket to Miley Cyrus’ “Bangerz” Tour led to my first article that was published in Milwaukee. 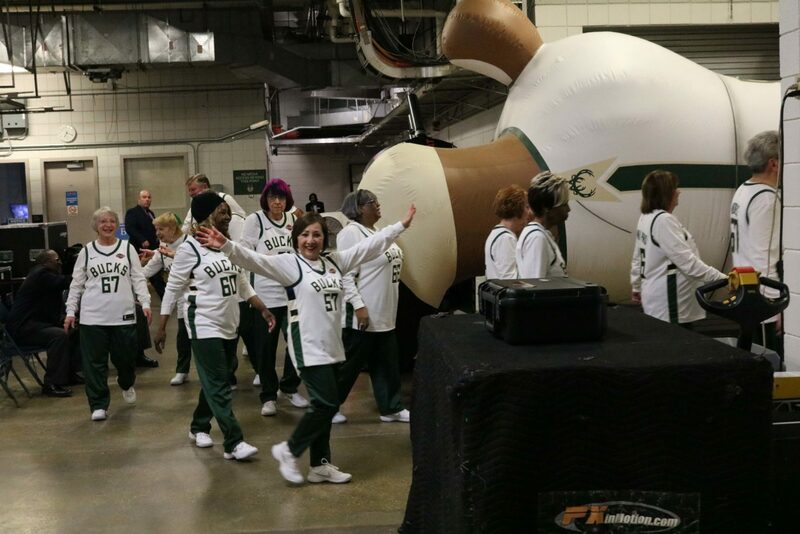 Last December, my fiancé and I experienced a similar pop extravaganza when Katy Perry’s “Witness” Tour rolled through town. During Purity Ring’s opening set that night, the stage lights shot straight up, illuminating the rafters. 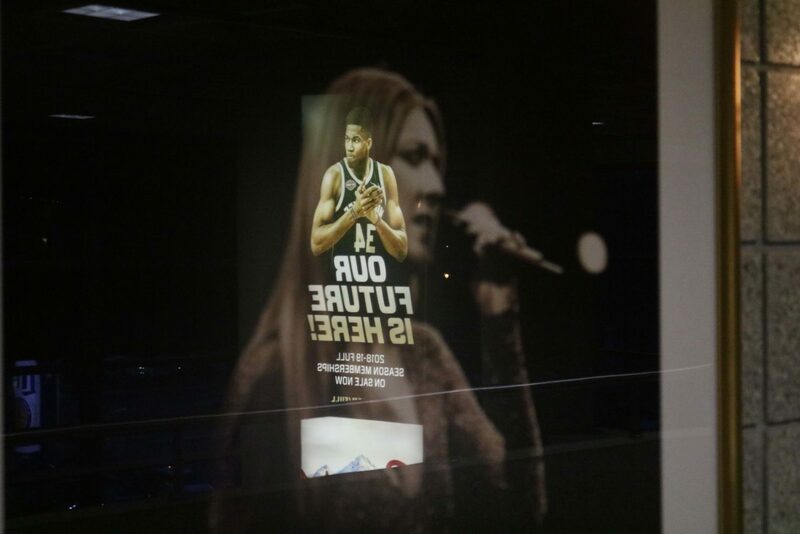 A wave of melancholy rolled over me as vocalist Megan James sang about “the last season” and I stared at the Bucks banners. 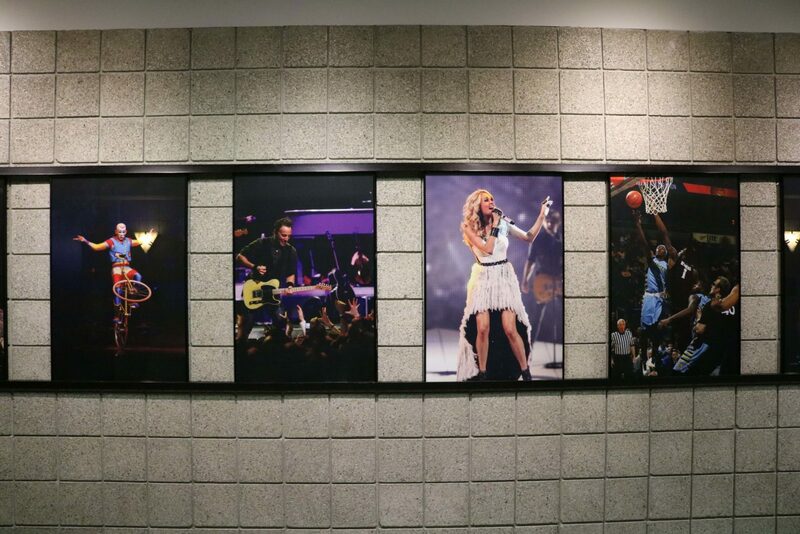 In March, Lorde kicked off the North American leg of her “Melodrama” Tour at the Bradley Center. Hip-hop supergroup Run the Jewels made their first Milwaukee appearance as the opener. 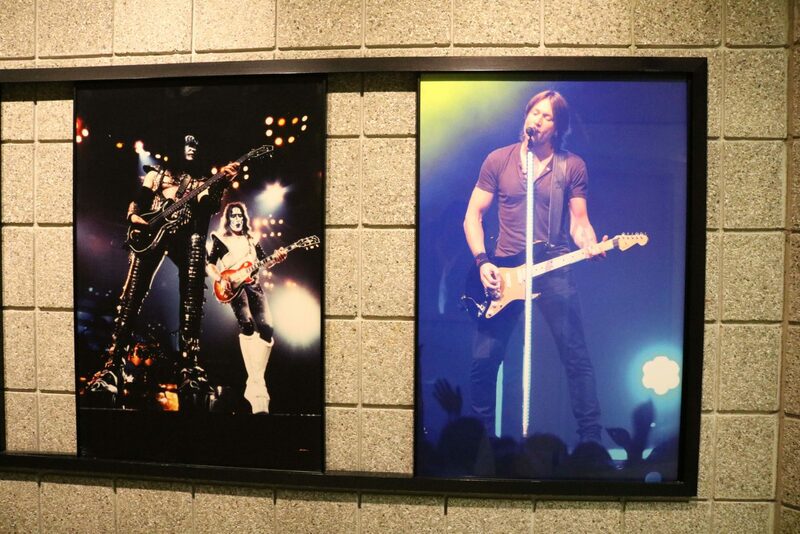 It was a sensational show and a pleasure to bring my fiancé’s son to his first arena concert. 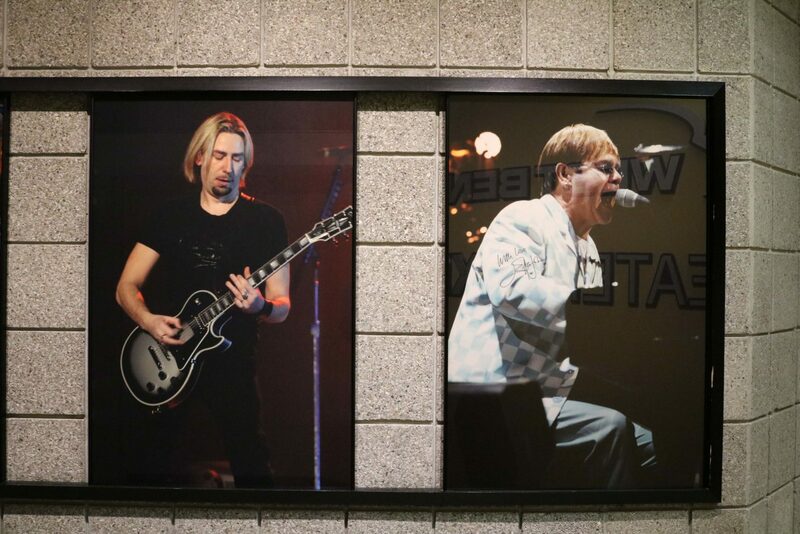 On April 29, Bon Jovi headlined the final concert at the Bradley Center, which was the perfect bookend considering Bon Jovi was the first band to sell out the arena. 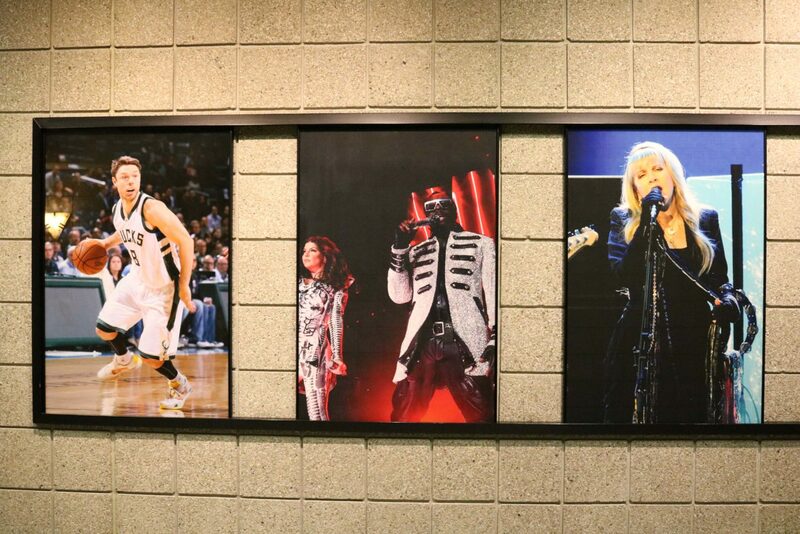 In its 30 years, the Bradley Center hosted more than 300 concerts, including Prince, Bruce Springsteen & the E Street Band, Paul McCartney, The Rolling Stones, U2, Pearl Jam, Dr. Dre, Frank Sinatra, Janet Jackson, Guns N’ Roses, Tina Turner, Celine Dion, Faith Hill and Tim McGraw, Paula Abdul, The Black Keys, Taylor Swift, Lady Gaga, Justin Bieber, Pearl Jam, Garth Brooks, KISS, Gloria Estefan and many more. 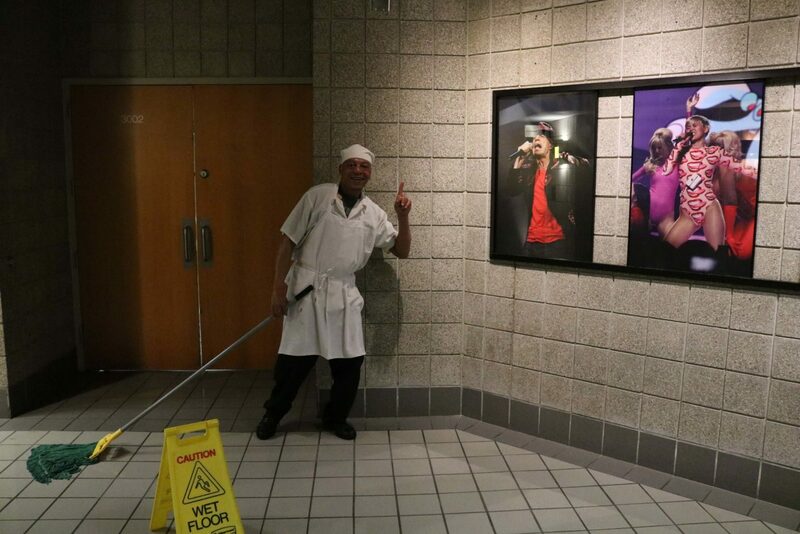 Few local musicians have performed at the Bradley Center more than Rhonda Begos-Zolecki. 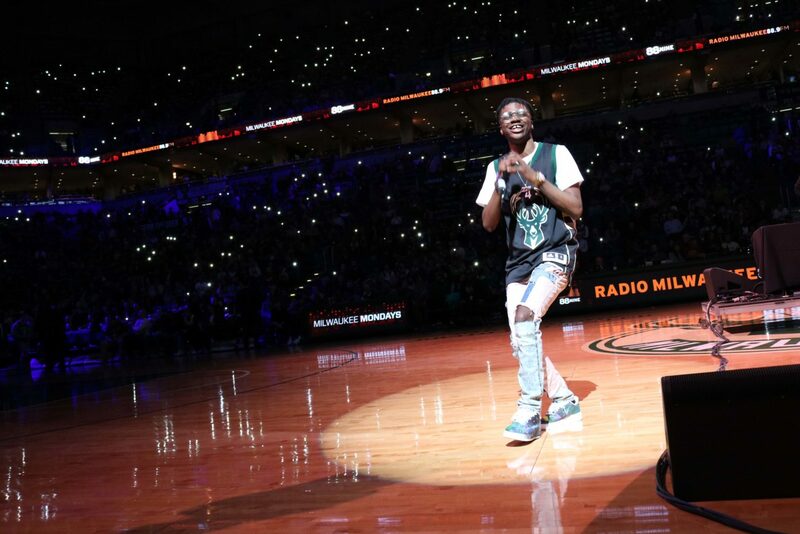 Over a 15-year period, the Berklee-trained singer was the “go-to anthem girl,” performing “The Star-Spangled Banner” at various events, particularly Milwaukee Admirals games. Begos-Zolecki was also a member of the Bucks house band Streetlife. 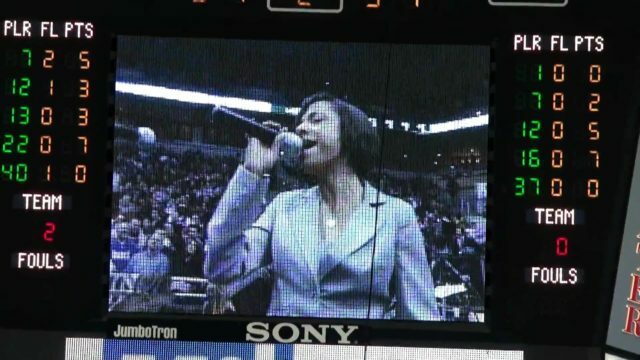 Rhonda Begos-Zolecki singing with Streetlife at the Bradley Center. 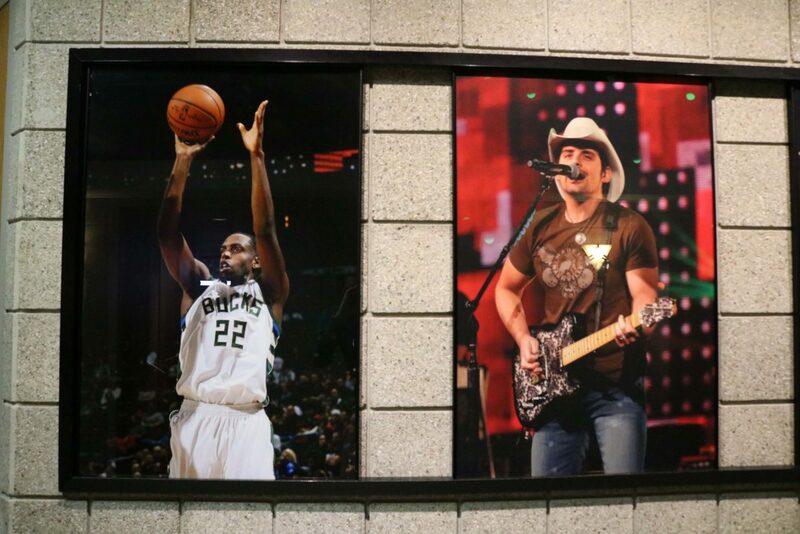 With a lifetime worth of memories that include my kid brother’s famous catch, mind-blowing concerts and a one-on-one locker room chat with basketball royalty, what I will remember most about the Bradley Center is the winter of 2013-2014. 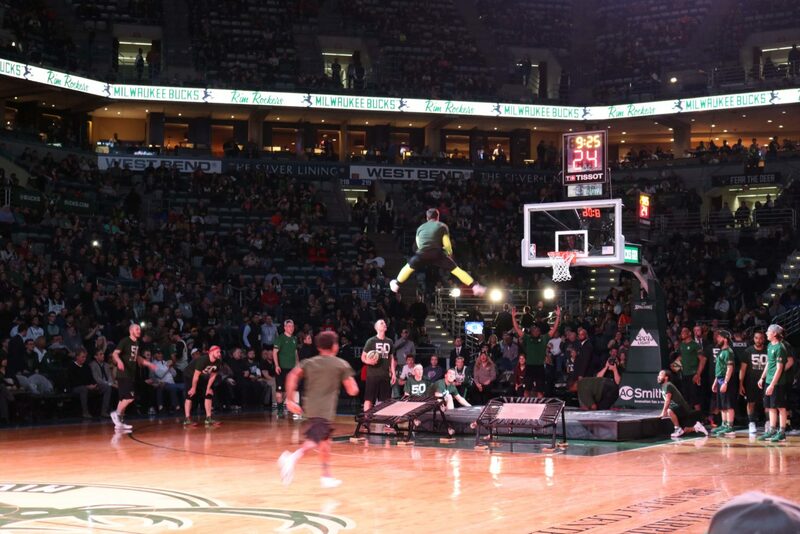 At the time, I had just moved back to Milwaukee after being away for almost a decade. I was picking up the pieces from my last relationship and struggling to find a job. 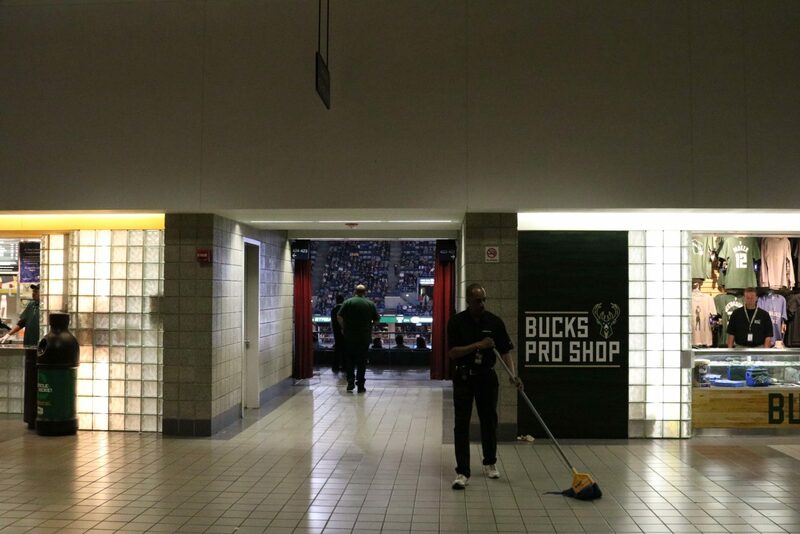 That year, the Bucks were having their worst season in franchise history. 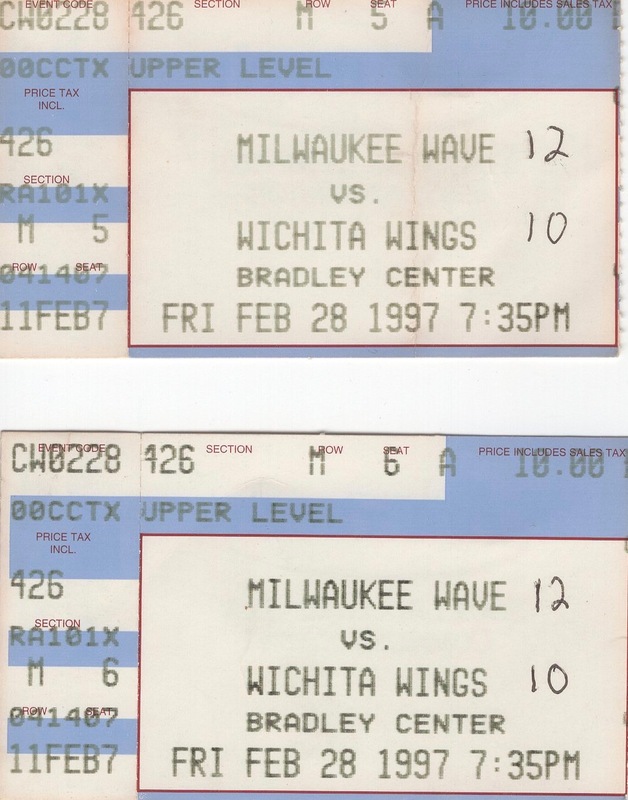 As a result, tickets were cheap and I went to a bunch of games with a couple of high school friends who worked downtown. 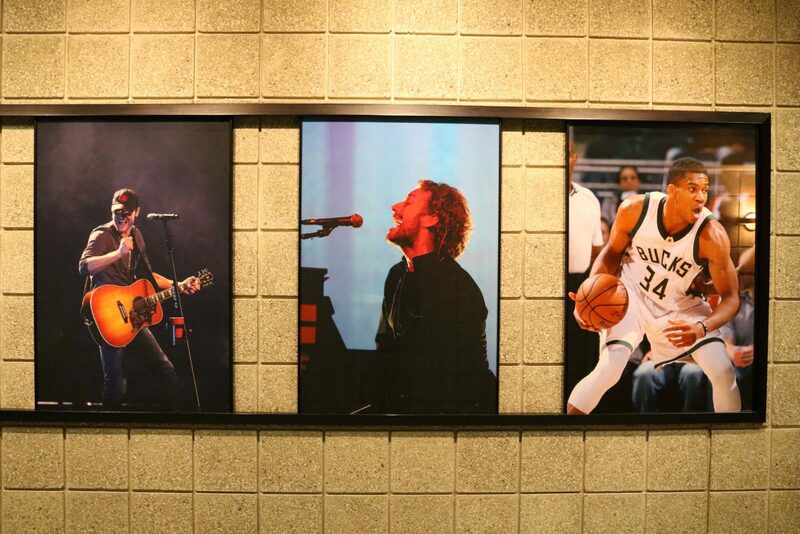 The Bradley Center became a place of solace. 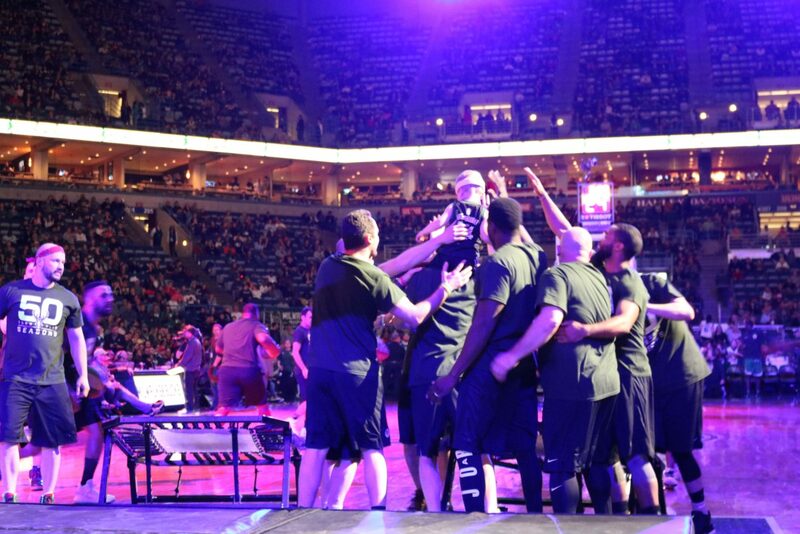 We could care less that the Bucks were so bad—win or lose, we had our team and we had each other. 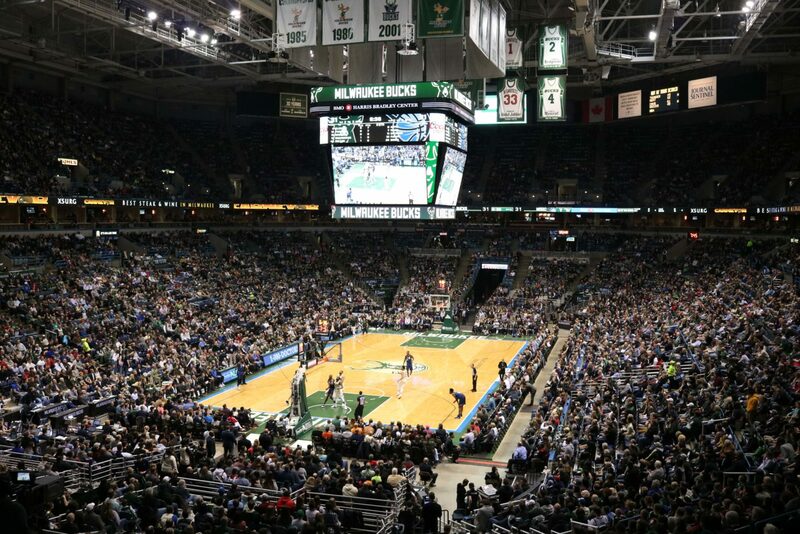 In a similar way, the Bradley Center has been there for Milwaukee. 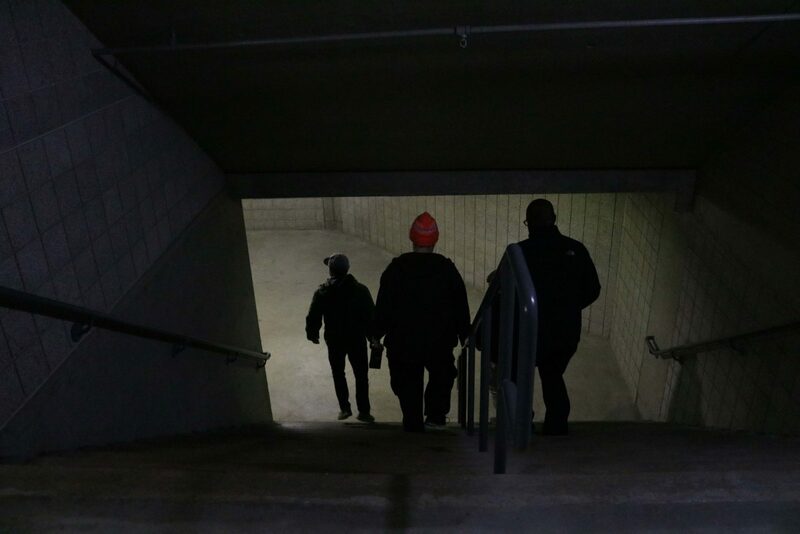 By the 1980s, Milwaukee’s downtown was struggling due to suburban flight and the deindustrialization of the 1960s and 1970s. 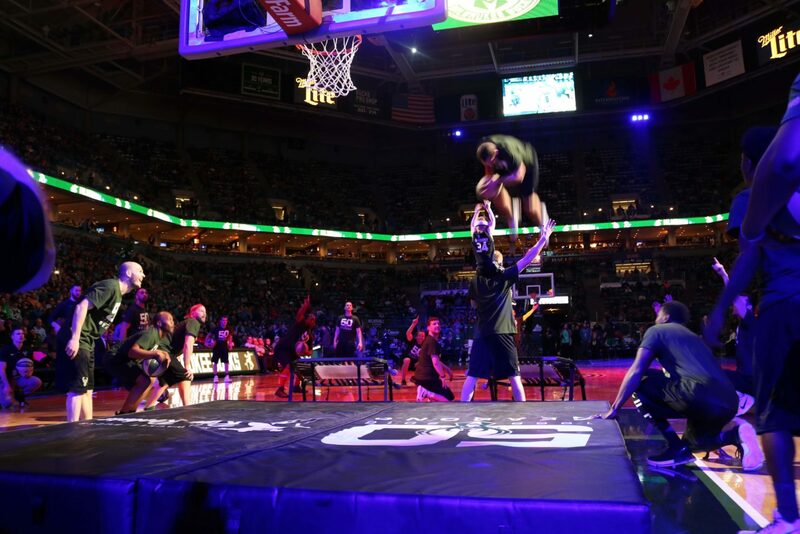 The arena gave downtown a much needed boost of economic and cultural energy. 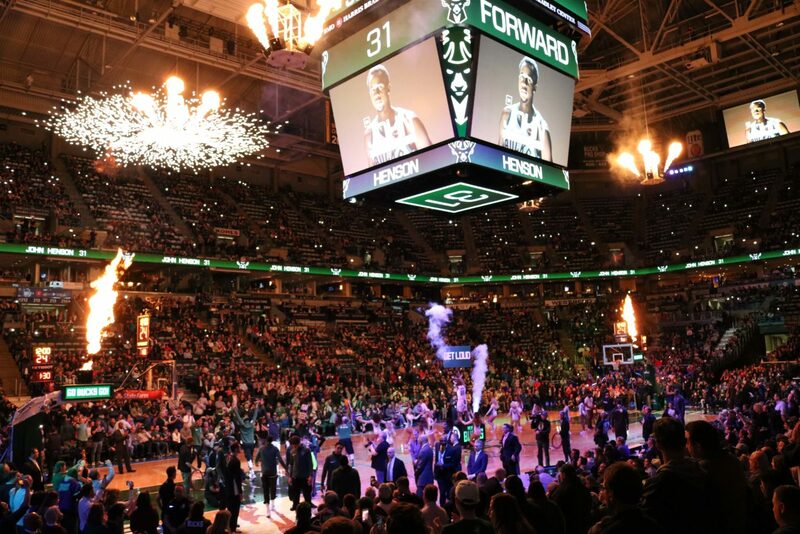 On August 26, the Bucks and Milwaukee begin a new chapter in our history with the grand opening of Fiserv Forum. 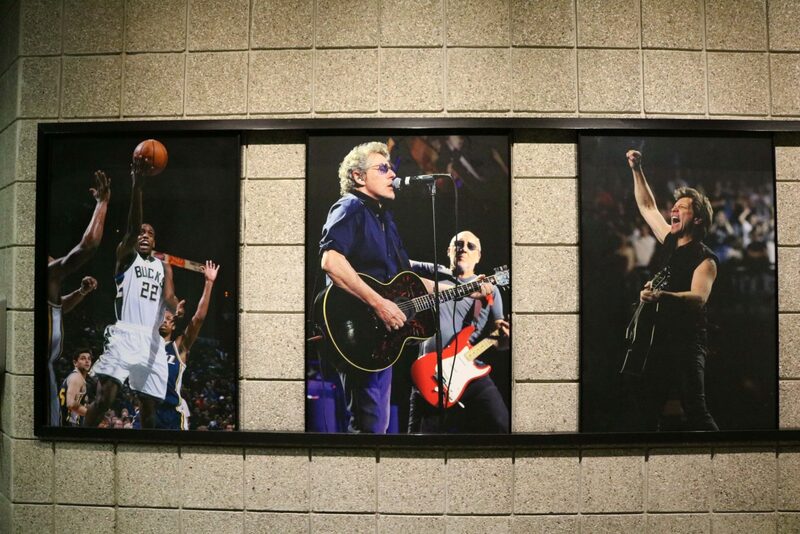 The new arena is across the street from where the Bradley Center stood strong for 30 years. 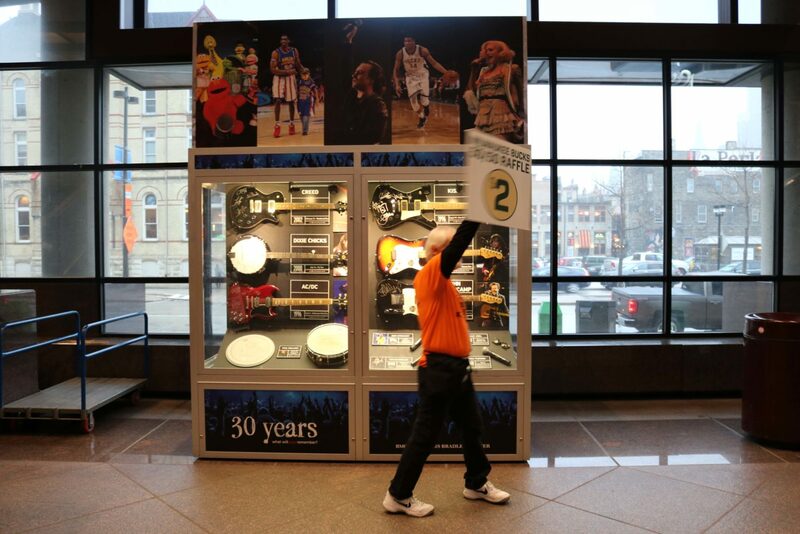 From the past to the present, here’s to another lifetime of unforgettable memories in downtown Milwaukee.